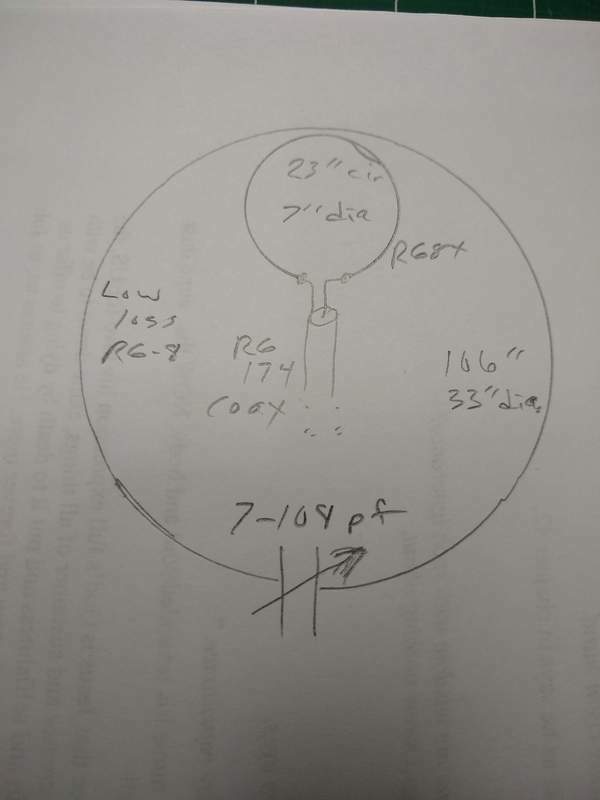 2019-04-15 Yesterday in a Facebook Group focused on magnetic loops I read a discussion of where the capacitor and driven loop should be located on the main loop. Specifically should the capacitor be at the top or bottom and should the driven loop be opposite that. The "expert" in the discussion who apparently has been involved in commercial design of small magnetic loops argued, convincingly I might add, that the capacitor should be at the top and the driving loop at the bottom. 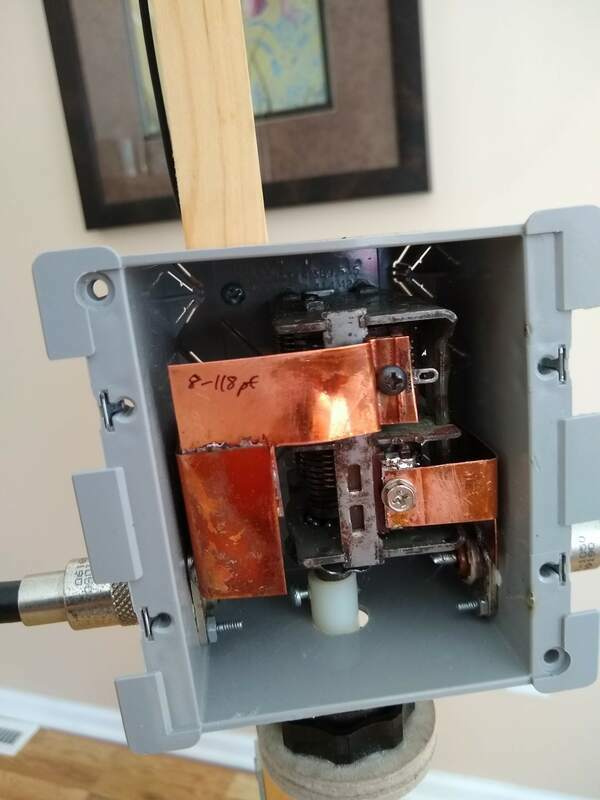 Why, well the extremely high voltage across the capacitor should be as far from surrounding metal things as possible, including the coax that connects to the driven loop. 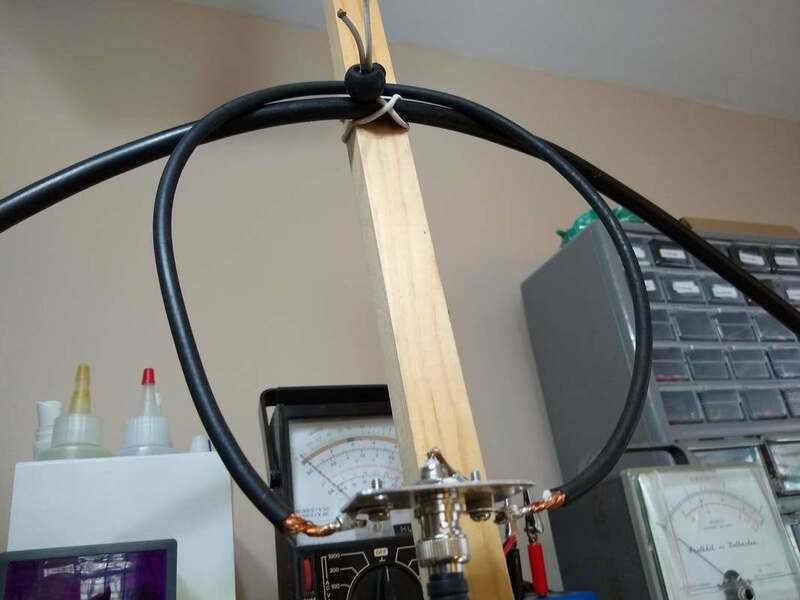 Since most magnetic loop supports are metal and if the driven loop is at the top the coax usually drops right past the capacitor those two things reduce the effectiveness of the loop. He went so far as to say something like that such an arrangement significantly interferes with the loops performance and much of the "good" people attribute to it is likely from feedline radiation. 2019-02-22 Today my rebuilt magnetic loop made it outside for the first time. Winter here in southeast Wisconsin has been close to brutal this year with temperatures dipping to minus 25f and wind chills down to around minus 65. And snow... We've had something approaching 40 inches so far! And some of that mixed with freezing rain and ice. Being outdoors was something to be minimized, certainly not played in by guys like me. So today's bright sun and temperature of plus 38 degrees inspired me to take my magnetic loop, Xiegu x5105 and straight key out and set up in the driveway and enjoy the warm sun while trying to make a contact or two. The result? Well, not a suntan! But I did have one good 5 watt CW QSO with W5MIG 1040 miles southwest in Texas on 20 meters! I heard and called a number of other stations on 20, 30 and 40 meters but couldn't raise them. Very few were strong and the QSB was pretty bad even with the strong ones. But I was happy! With QRP one decides ahead of time to be happy with the results... to savor each contact. I'm not sure if it was the antenna or what, but the atmospheric and other noise levels were very low on all of the bands. I think getting away from the house may have made a difference. The low band noise also highlighted the antenna's rather narrow radiation pattern. It was obvious when you were pointing right at the transmitting station. 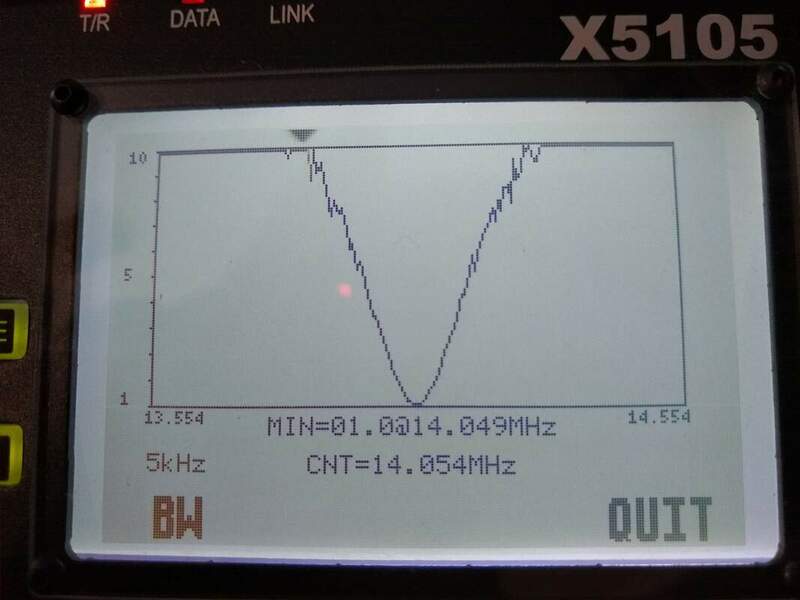 At the same time the low band noise made it a bit difficult to find the resonant point because there was little noise to peak when the antenna was tuned. 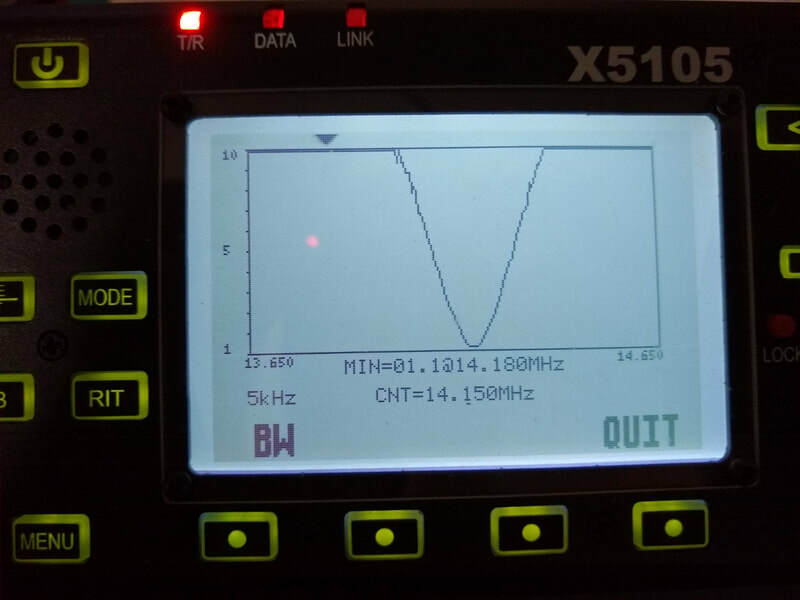 On 30 meters I had to resort to decreasing the transmitter power to minimum and holding the key down while tuning the capacitor to even find the resonant point. First "outing" with the mag loop, even if just onto the driveway! I was rewarded with one 20 meter CW QRP QSO with a station 1000 miles south in Texas. Even though I only had one QSO it was really fun to set up pretty much like I might in some more remote portable situation. I was surrounded by all the modern amenities but not connecrted to nor using them for that hour or so! That's portable isn't it?! 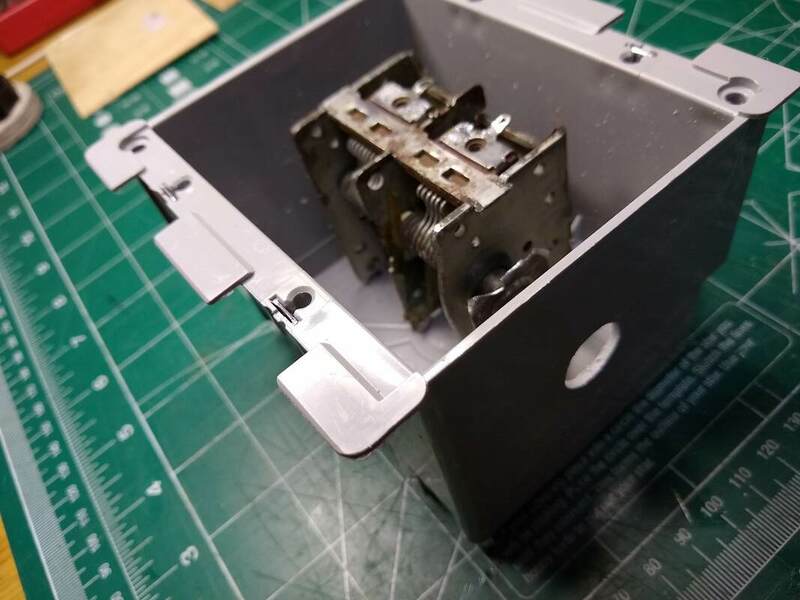 2019-02-17 I think I've actually completed the rebuild, including the jacks to plug in the 40 meter tuning capacitor and a cover for the electrical box. I made on e 40 meter QSO with it this afternoon during the DX contest with a CJ3A Islington Ontario, 473 miles north east of here. He was 589 and gave me a 559. 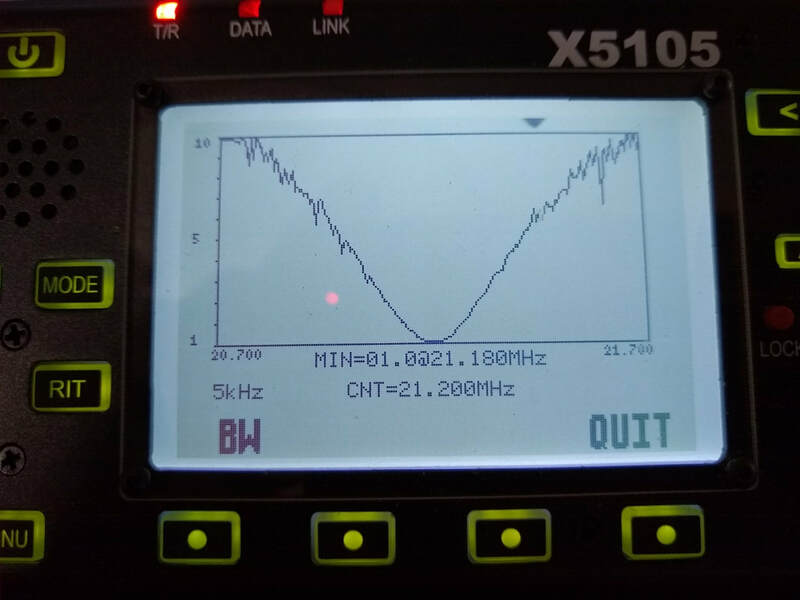 I was once again doing CW with my x5105 at 5 watts. 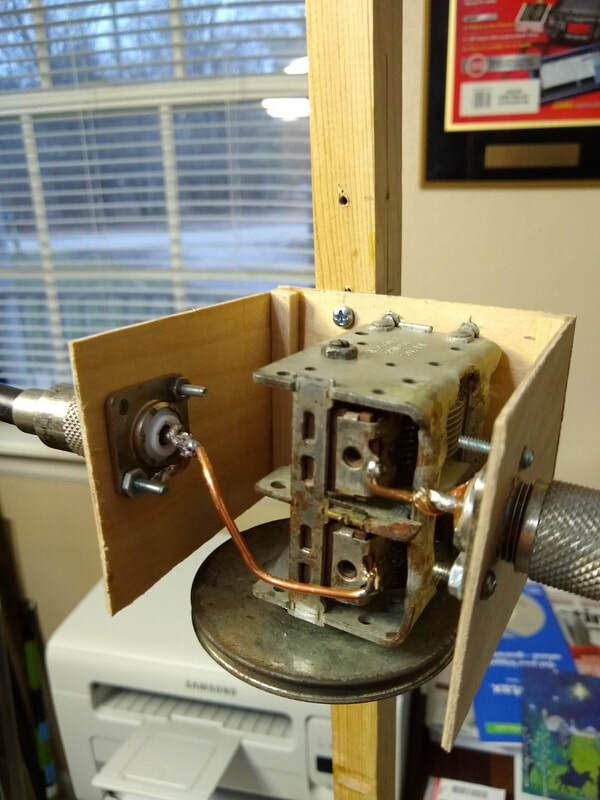 2019-02-15 Well, I've finished the rebuild of my magnetic loop. The good news is that it still works. The bad news is that I can't tell if it works any better than before! The Q may be just a bit higher but I can't be positive. I'll play with it over the next few days and see whether in use I feel like it works any differently. My objective was two fold. 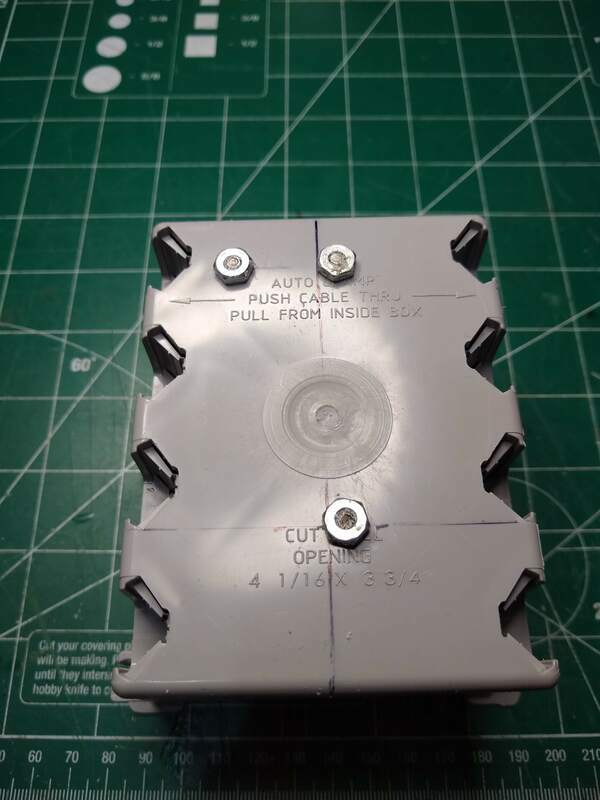 1) to try to reduce losses due to connections to the capacitor. 2) to clean up the build somewhat by replacing my home brew wooden box housing the capacitor with an electrical box. On point 2 I was successful. Whether it looks or works any better is open to debate. Temporarily (I hope) I've lost 40 meters as I haven't remounted the connectors for plugging in the additional fixed capacitor needed for that. On point one, if indeed the Q is a bit higher then that too was successful. 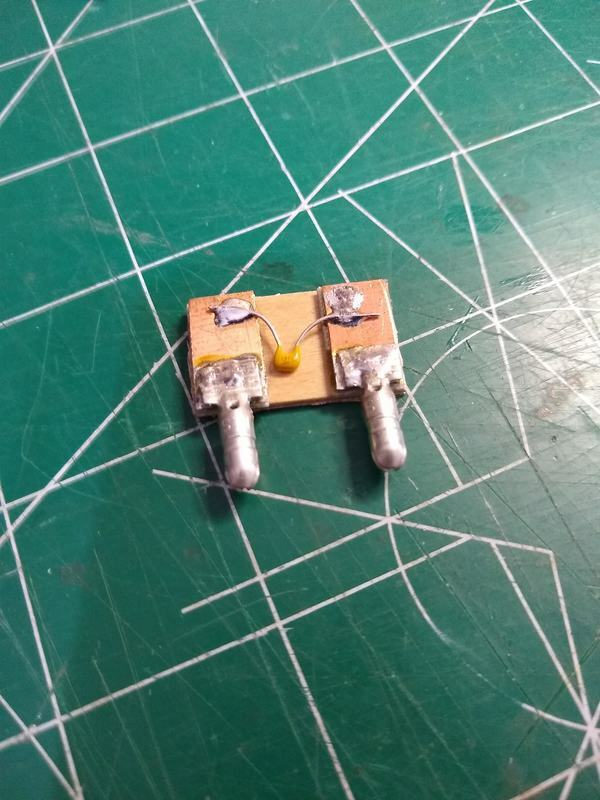 I made the connections between the SO230 jacks to the capacitor with copper strap with all connections screwed and soldered. I connected only the shield of the radiating loop to the capacitor. I may make a connection to the center conductor also, we'll see. 2019-02-14 As you can tell from my comments below I am impressed with my magnetic loop. But as I've continued to read and watch YouTube videos about magnetic loops I'm concerned about the quality of the connections I have made between the loop and capacitor. So last night I decided to disassemble it and try to make those connections more robust and hopefully less lossy in hopes that the performance of the loop will improve even more! Mag Loop on MidCars, 7.258, 5 watts, SSB. 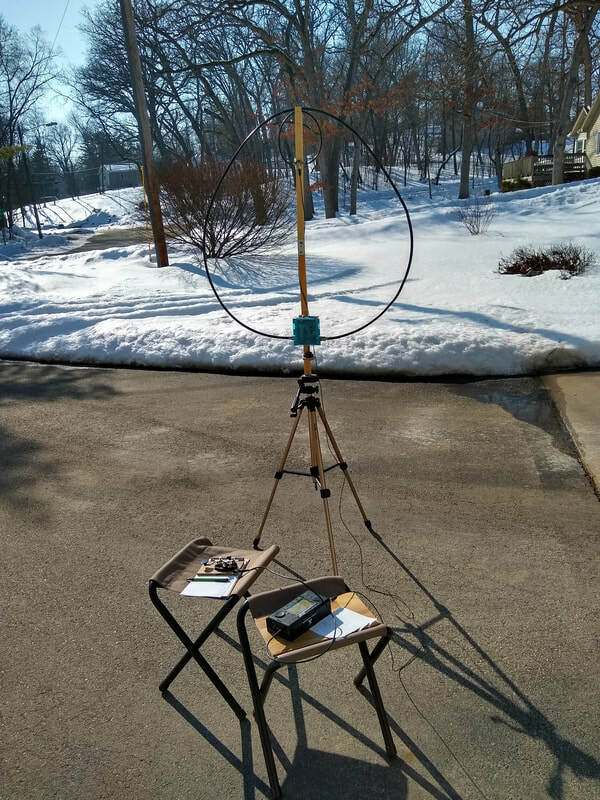 2019-02-08 Two days ago I set up my Wolf River Coils Silver Bullet 1000 TIA antenna outside on our sidewalk. It was cold and the sidewalk was icy as we had an ice storm overnight. I was overjoyed to have three good QSOs. one each on 20, 30 and 40 meters. Click here to see all about that. That antenna is my latest addition so it has gotten moist of the attention the past week or so. I tuned up on 7.258, the MidCars frequency and listened. At first it was discouraging. I could just barely detect anyone, including the net control. But today it was zero F when I awoke and it is only ten now with strong winds, brutal! I had a nice 40 meter CW QSO about 7:30 this morning with a station in NC. I was running 25 watts and using my G5RV. But about 11:30 I decided to break out the mag loop and try a QSO. Then he handed net control over to W0UZR up in Minnesota. Steve was a solid 57 and when he asked for mobiles I chimed in. He recognized my call as I check into MidCars from time to time. We only talked a couple minutes but he heard me and was amazed that I was running five watts using a loop. Another successful SSB QSO for the Mag Loop! I love this antenna. Unfortunately I love ALL my antennas! I also love QRP. It is addicting! Now I want to brave the elements and set up the Silver bullet again! 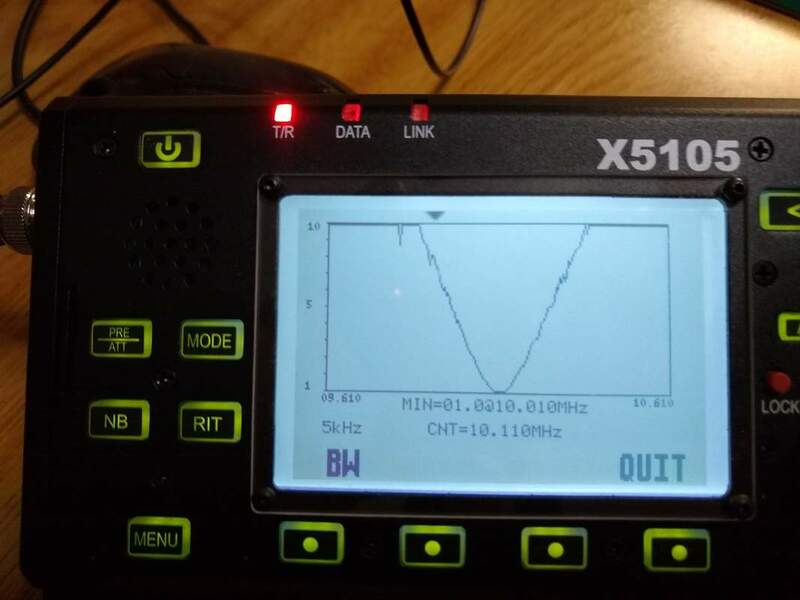 2019-01-22 The past few weeks I've been playing ham radio with my new IC-7100 doing CW, SSB and this last weekend D-STAR, which I've only had set up for a few days now. 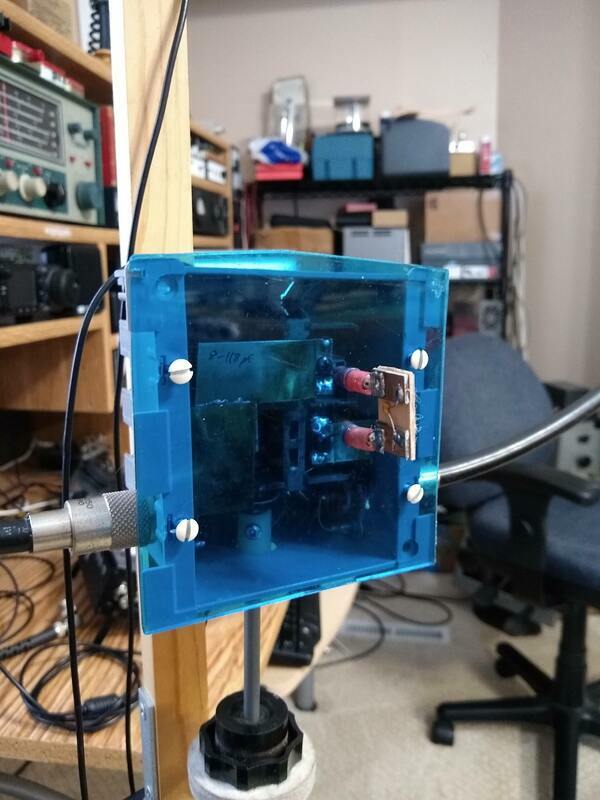 My mag loop sort of took a back seat as I enjoyed HF at 25 watts and my G5RV and then D-STAR. But then yesterday D-STAR "broke down", some system problem I think. 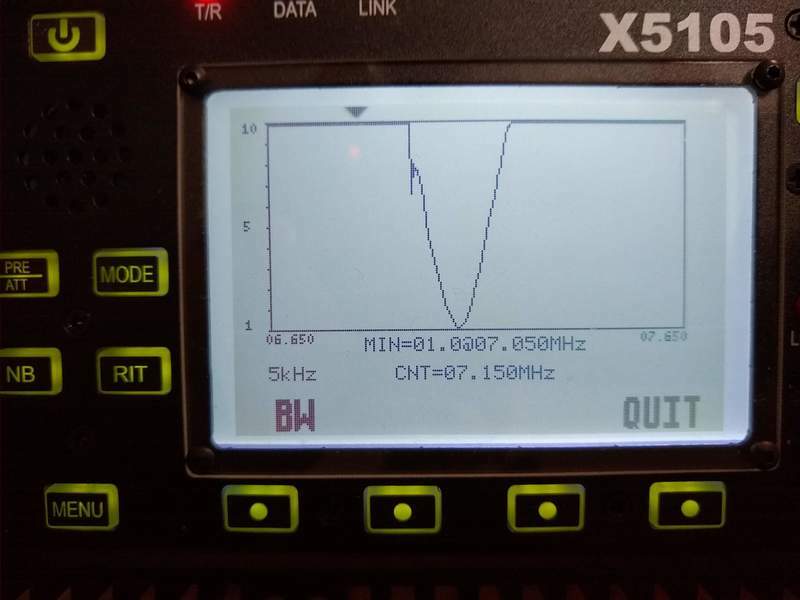 I looked over at my loop and X5105 QRP rig and CW straight key and decided it was time to "go back home!" The result? A 40 meter QSO last evening with a station in Maryland and another one with a station in Ohio this morning. 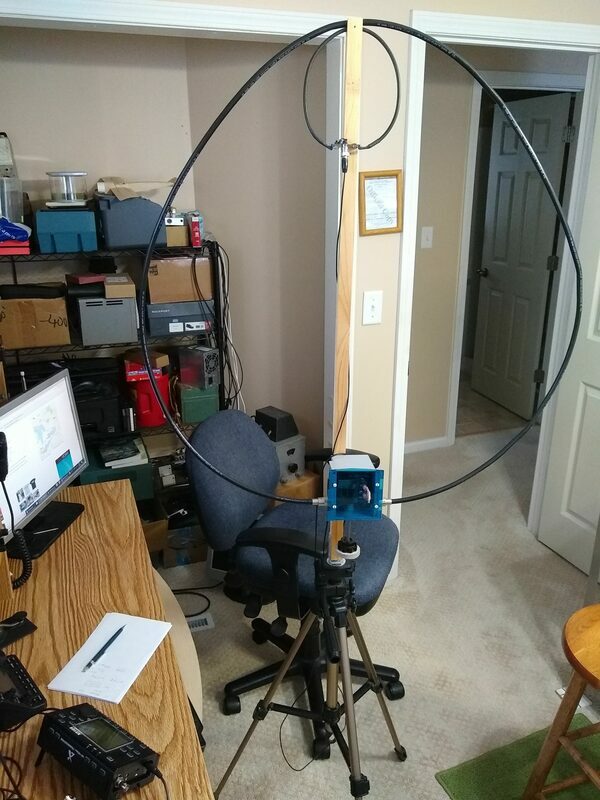 Still can hardly believe this 3 foot loop, sitting atop my camera tripod just a few feet from my radio works so well, especially on 40 meters! Basic, simple "radio" is still exciting! 2019-01-06 If you are looking for "the worlds best antenna", this is NOT it! If you are going to build it I think it should be because you are curious and like to try new things. 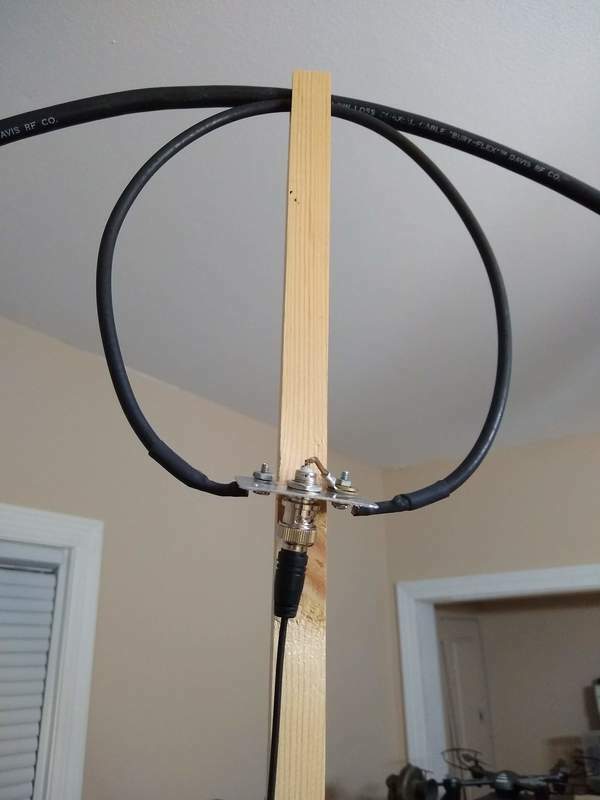 NOT to solve all your antenna problems. A simple dipole or G5RV with tuner will work much better. Having said that, I am constantly being amazed by it, like this morning (2019-01-08). I set it up in the living room because it is a fairly large open space in our house. 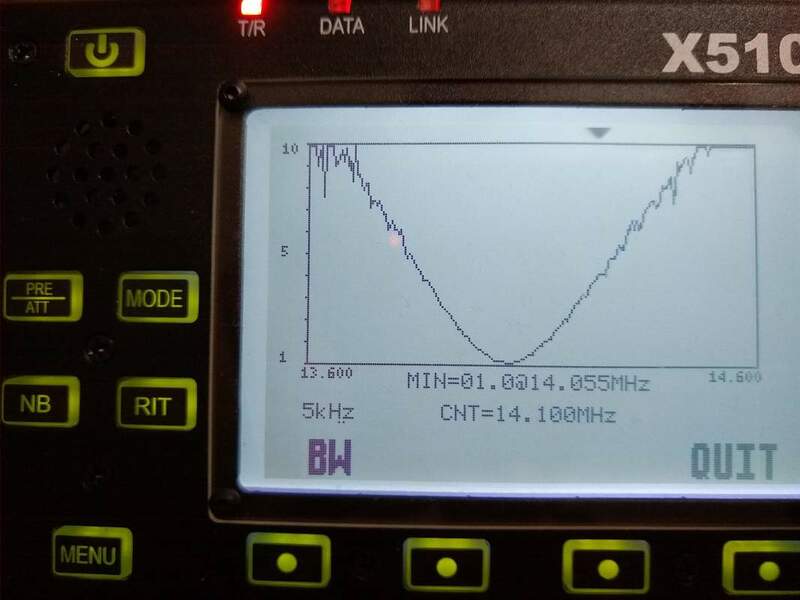 I connected my Xiegu x5105 five-watt rig and tuned it and the antenna to 7.258, the MidCars net frequency. Rotating it around on my tripod I found the strongest signal point for the net control, N8TUW 360 miles southeast in Ohio. He was coming in at about 57. When He called for mobiles I chimed in ending my call with QRP. He came back immediately, giving me a 55! Just to be sure I did a recheck about a half hour later with the same results! And that was SSB, mind you. It was like making my first contact with my new Novice license sixty years ago. THAT's the mystique of this and many other "compromise" antennas. So if it interests you, go for it. You'll enjoy building and using it. My wife and I have a running joke in the kitchen. She says I like to putz. I like recipes that require some fiddling around, mixing, heating, stirring things in various orders and are usually not what my mother would have made. When I see something that I haven't tried in the grocery store, I tend to want to see what it can be used for. She, on the other hand, likes to put a chicken or roast in the slow cooker, pour a can of mushroom soup or packet of onion soup mix over it, maybe add some chopped onions, carrots and potatoes, and go do something else. I have to admit that her meals are always good and remind me of what Mother DID make! So no complaint from me. But I like to putz in the kitchen. And I'm always a bit amazed when we eat my concoctions if either of us says, "You know, it's not bad!" 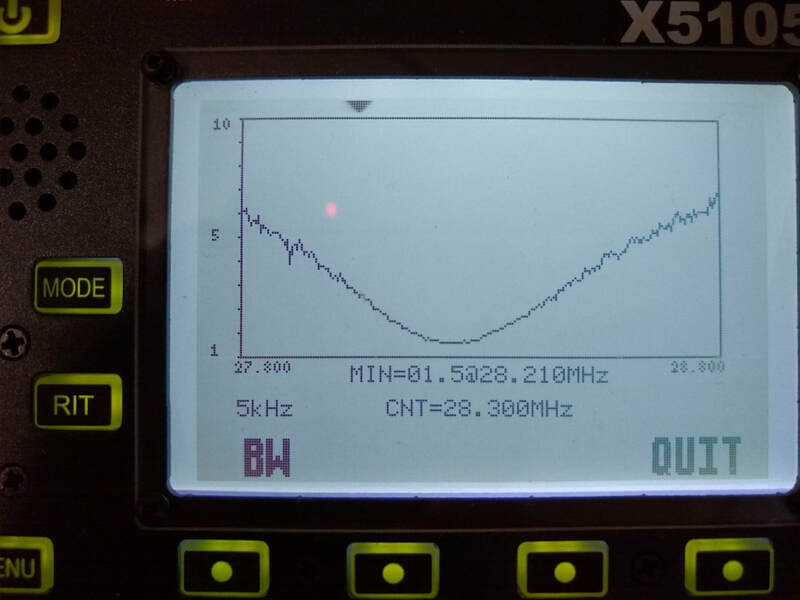 2019-01-02 With nine QSOs over the past 16 days on this antenna using 5 watts, four on 40 meters, including one SSB contact, three on 30 meters and two on 20 meters, I'm convinced that this is a viable antenna. Here is a summary of the details of the construction. 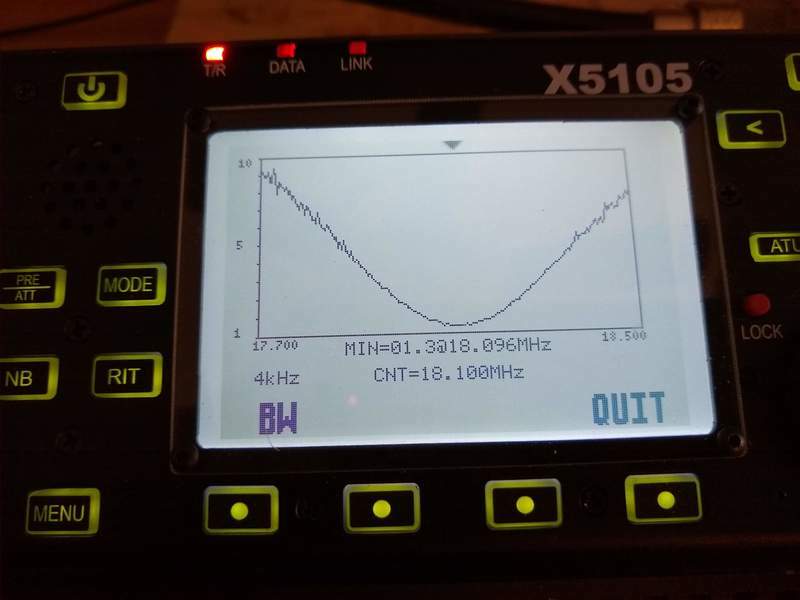 Usable on all HF bands between 40 and 10 meters. Maximum driving power is undetermined but works well for 5 watts. Main Loop: 106" in circumference (about 3' diameter). 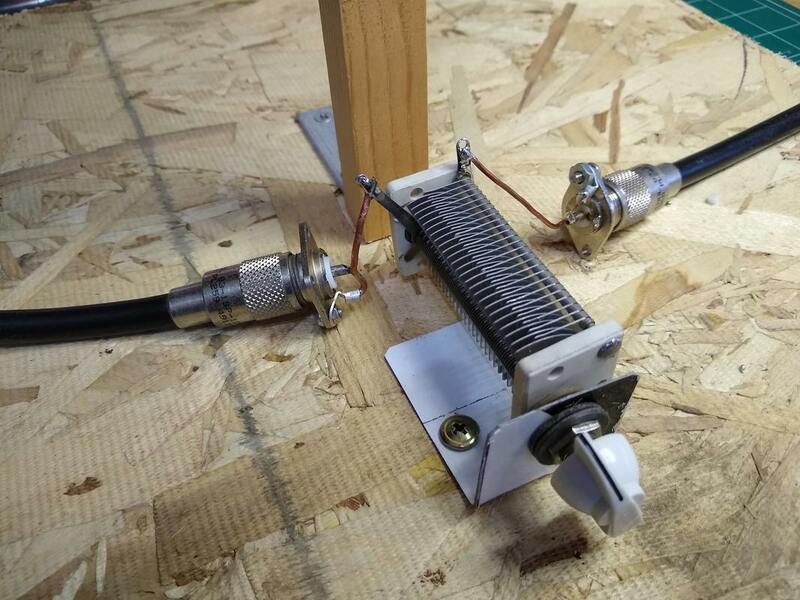 Made of Low loss RG-8 sized coax with center conductor and shield tied together on both ends on the SO-239 UHF jacks. Drive (small) Loop: 21" in circumference (about 8" diameter). RG-8x with the center conductor and shield soldered together at both ends so it is essentially a single of wire. Connects to a BNC jack (for the feedline), one end to the center the other end to the outer or ground side of the jack. Capacitor: Old am radio tuning capacitor with a range of 8pf to 118pf which tunes the loop from 30 meters to 10 meters. A 158pf fixed capacitor is paralleled to tune 40 meters. The two sections of the capacitor are connected in series to get the right capacitance. I did this by connecting one of the SO-239's to one stater and the other SO-239 to the other stater. The movable rotor capacitively couples between the two. 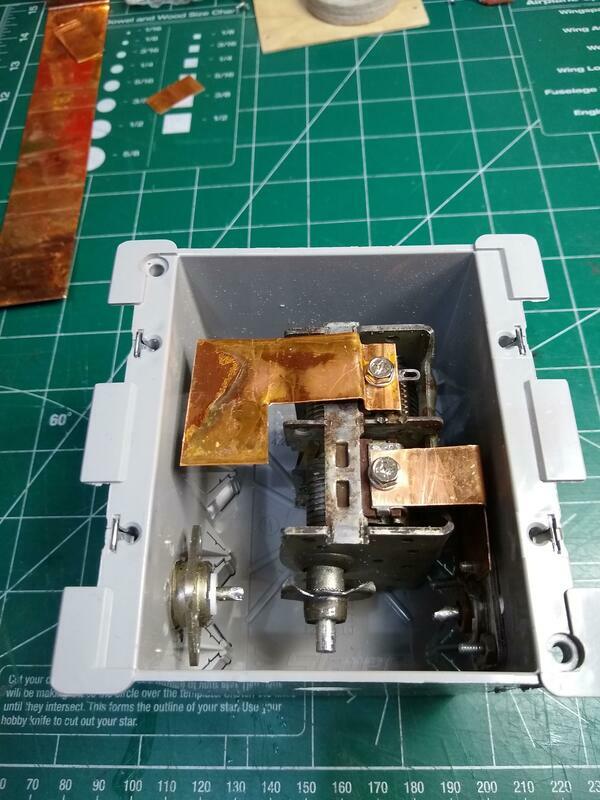 In addition to getting the range that I wanted it avoids any wiper or movable contacts from the RF current loop reducing losses and making tuning smooth. Feed-Line: I used a 25 ft length of RG-174 for the feed-line to keep things light weight. 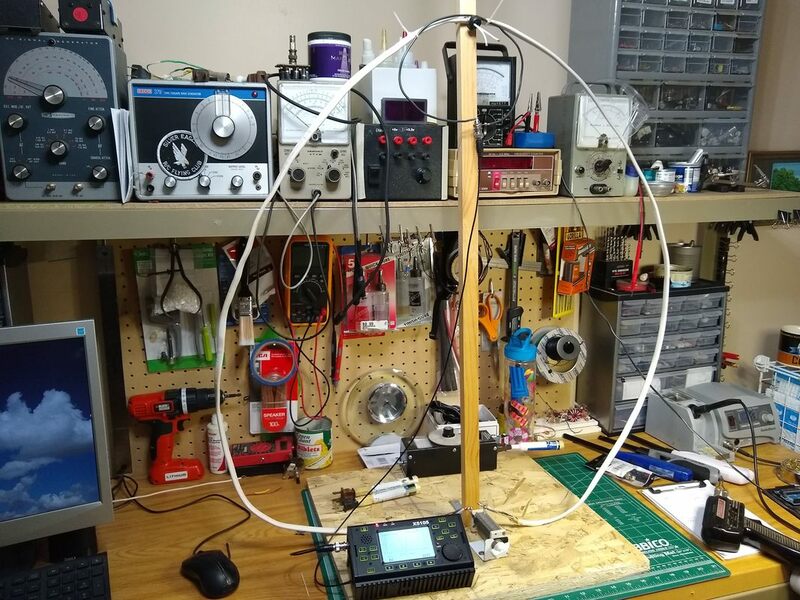 2019-01-01 Ok, I declare that this antenna is for real! 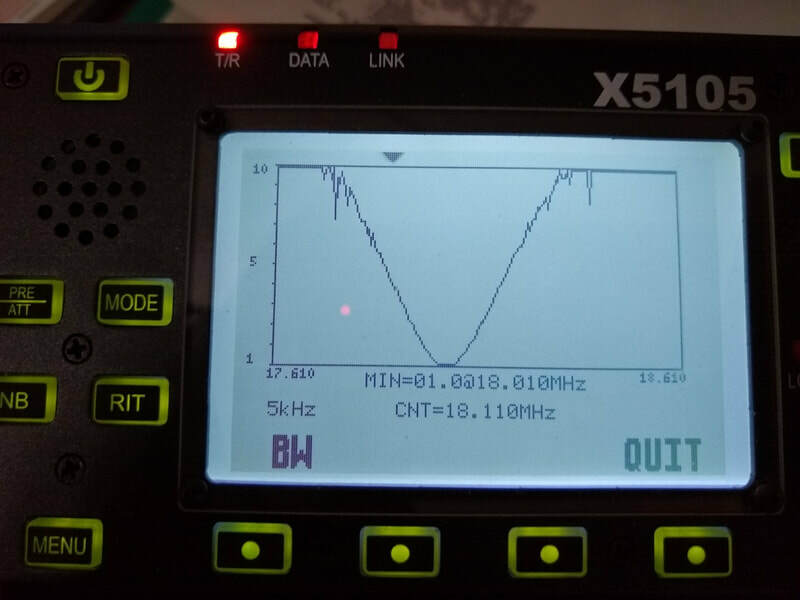 Just had a second 40 meter, QRP CW QSO with it using my x5105. That makes two on 40, three on 30, and two on 20, all CW at 5 watts using the x5105. And all in my ground level shack. And band conditions were poor for all of them. Simply fun! 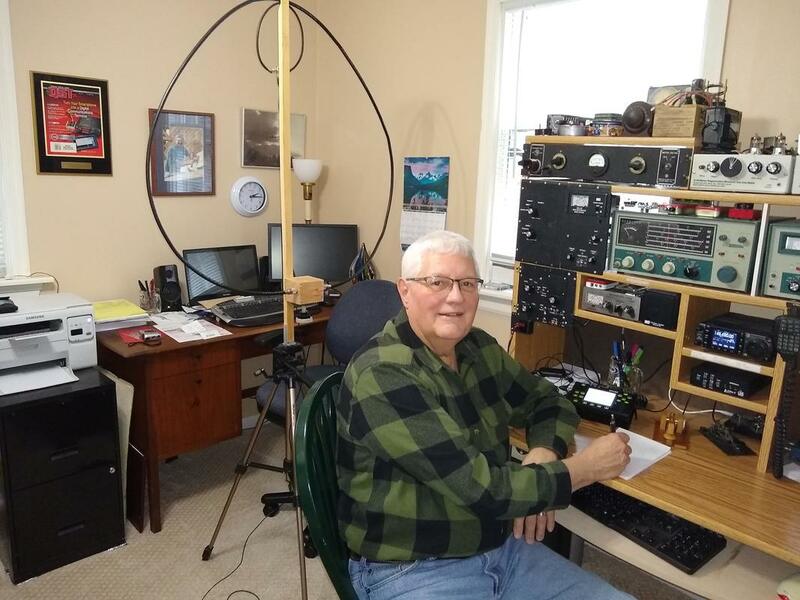 2018-12-31 It's 11:59 am and I just finished a QSO with VA3SZ in London, Ontario on 7.033 using 5 watts and the Mag Loop antenna with the hay-wired capacitors to put it on 40! Zen gave me a 559 and he started at 559 here but actually rose to near 599. I guess I shouldn't be surprised but I am. The calculator above says the antenna is about 1% efficient on 40 meters which means not much signal is getting off the antenna. It is sitting on my ground floor shack on a camera tripod with the bottom of the loop 40 inches off the floor! I've now had one QSO each on 20, 30 and 40 meters. I'm becoming a believer! 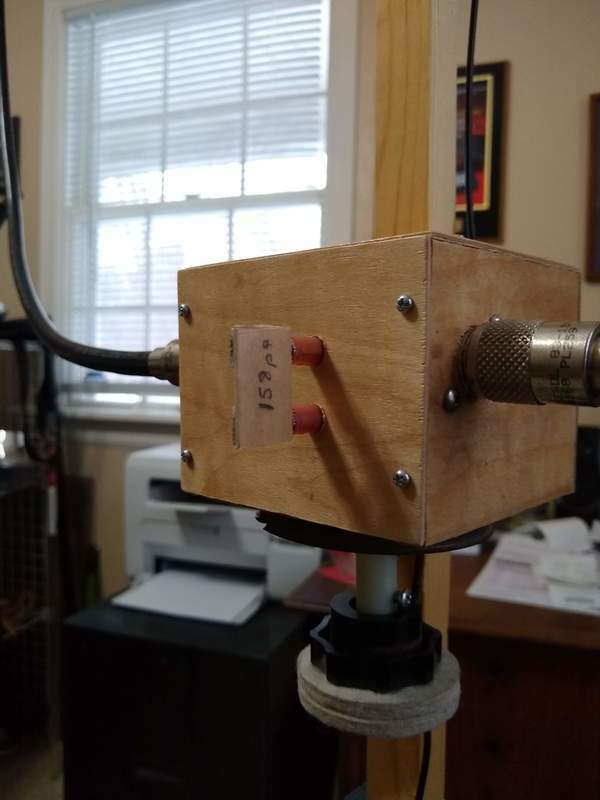 2018-12-27 I have been thinking about two improvements to this antenna for several days: 1) getting it to work on 40 meters, 2) finding a larger tuning knob. Well I have at least a temporary solution for both today. The simplest one was the knob. Tossing around among my junk my eye caught a pack of self-sticking felt furniture pads to protect a hardwood floor from being scratched by moving furniture. I stuck two 2-inch ones together then stuck the pair on the face of the smaller knob I was already using. Works very nicely! It even feels good. And doesn't look terrible. I put some talcum powder on sticky face that the knob doesn't cover to it doesn't even stick to your fingers! The capacitor was a bit more involved. I wanted to use banana jacks and plugs, but didn't have any. However I did find in one of my junk drawers two pairs of plug-jack things normally used in wiring. I think they will work in the short term. My second issue was that I couldn't find an appropriately sized capacitor! 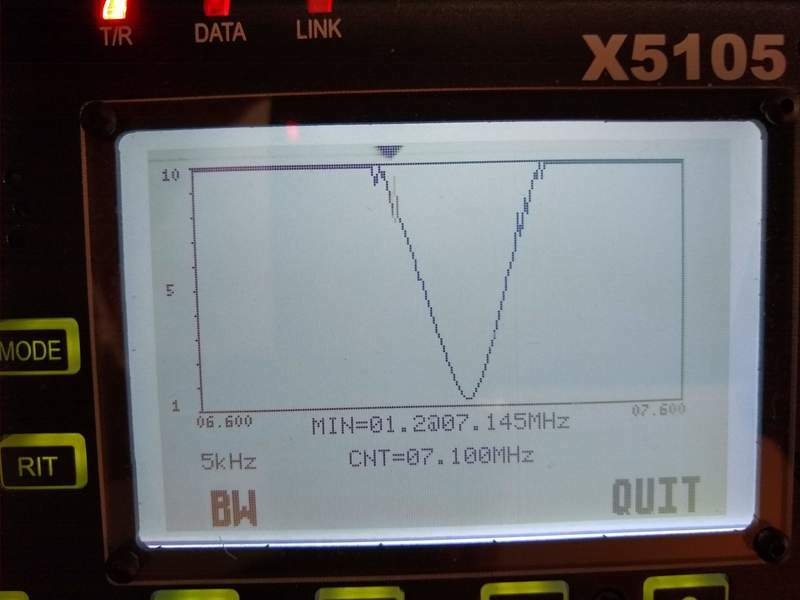 But by soldering a couple capacitors in parallel I came up with about 140pf which allows my variable to tune the entire 40 meter band nicely. Haven't had a QSO with it but did hear a few weak signals on the band which gives me hope! The SWR curve is much sharper than when I was using a different capacitor shown below. 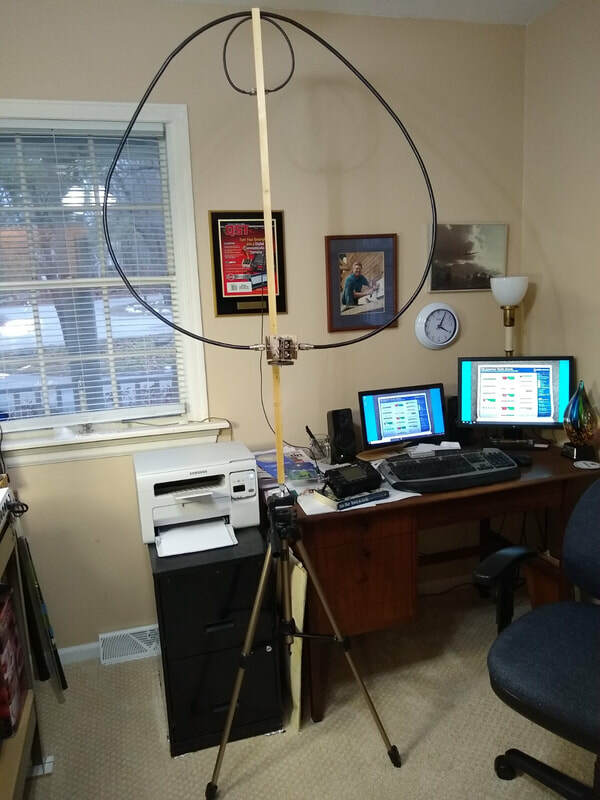 2018-12-24 A good Christmas eve day activity seemed like it might be to measure signal strength from the loop! So I set it up in a pretty open part of the house, about 8' from the island in our kitchen. 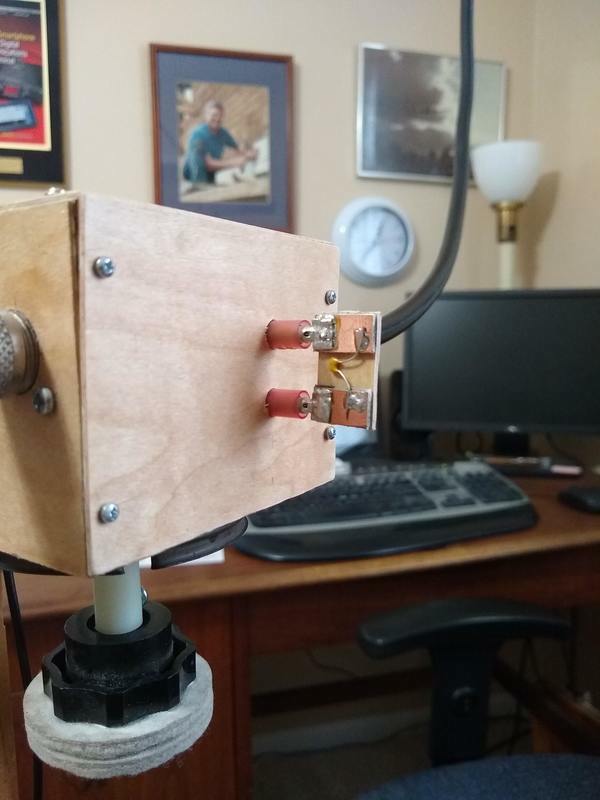 I put the field strength meter (FSM) on the island and my x5105 on the corner of the dining room table next to the antenna which was on my camera tripod. 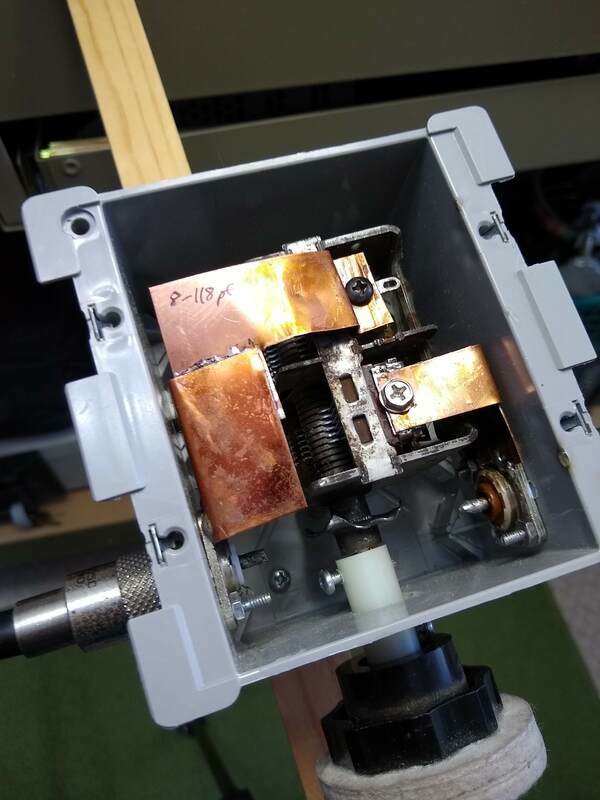 Then I hay-wired my CW key so it would stay closed, reduced the power to a half watt and transmitted away, first on 30 meters, then on 20 meters and finally on 17 meters. Results were quite similar on all three bands so I didn't go further. Now think of the right side of the loop (looking at the photo below) on a clock dial as 12 o'clock, and the left side as 6 o'clock and you'll perhaps understand what I'm trying to explain! On 30 meters, with the 12 o'clock edge pointed at the FSM it read 435mv. With the 3 o'clock edge toward the FSM it read 164mv. With the 6 o'clock broadside toward the FSM it read 387mv and with the 9 o'clock broadside toward the FSM it read 190mv. So Its front and back signal strengths are approximately the same which are about twice as strong as the broadside readings. The numbers on 20 meters were similar in direction but the front signal was about ten times as strong as the broadside. The 17 meter comparison was the same in terms of direction but the ratio of front to side was about 3 to 1. So the antenna is clearly directional, at eight feet anyway! 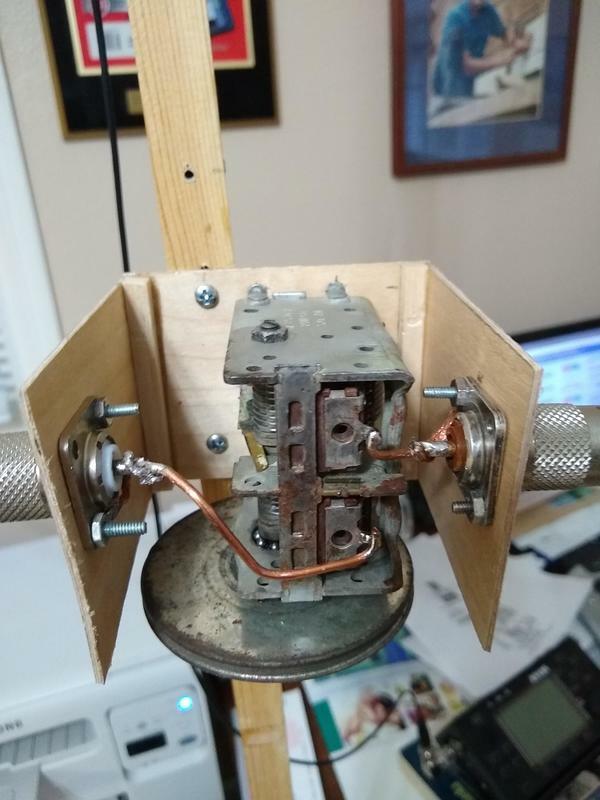 2018-12-23 After just a few relatively minor changes to the antenna this afternoon, none of them having to do with it's performance but rather its ruggedness and appearance I tuned around on the the 30 meter band and heard W5ZR at 10.119mhz in QSO with a station in Michigan. 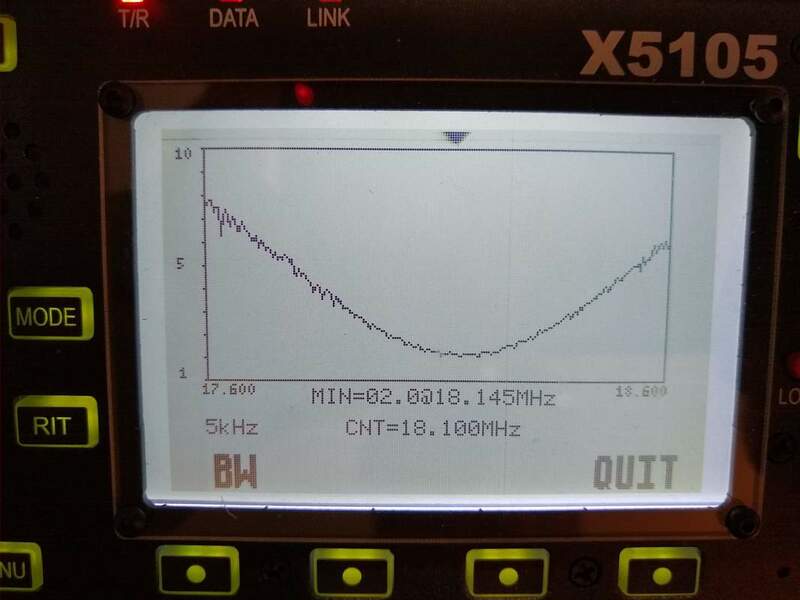 His signal was an almost steady 579 so I peaked the antenna at that frequency to a 1:1 SWR. Then I rotated the antenna to find the peak at 599. When he finished I gave him a call using 5 watts with my X5105. He came back and gave me a 579 with some QSB. We had a ten minute or so QSO, he running 200 watts to 2 element quad, so he gets some of the credit! Note: the center conductor and shield are soldered together at both ends of both the main loop and the small drive loop. 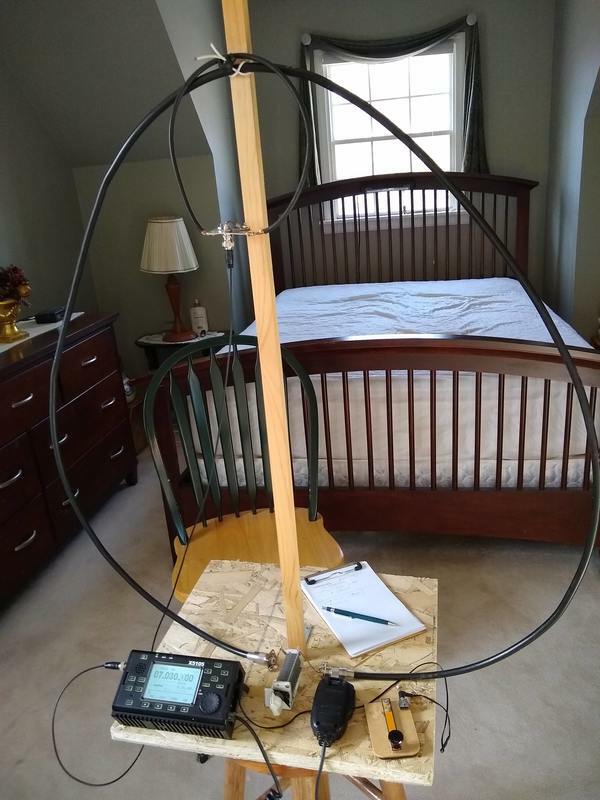 But no matter, the loop antenna works. That makes three QSOs with it, the other two on 20 meters while it was still in a rather makeshift condition. 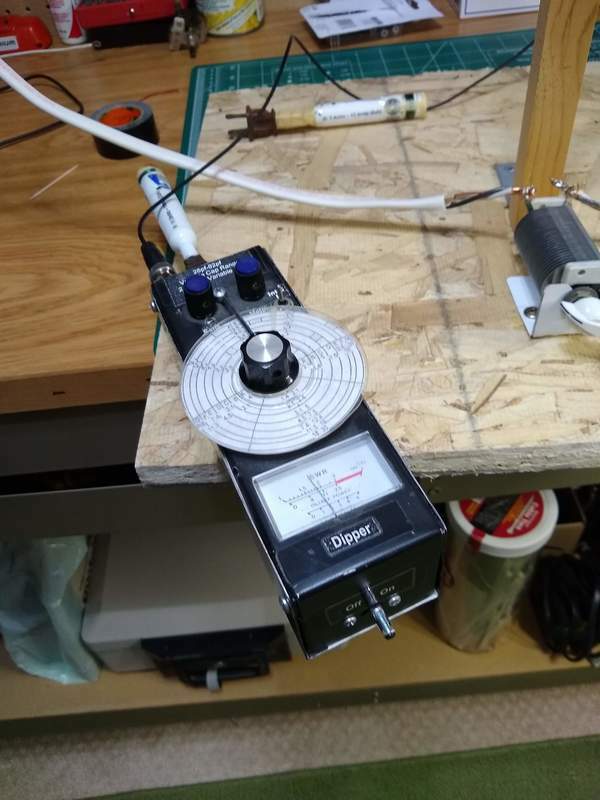 It's nice to know that it works on 30 meters, which is below its "optimum" given the loop circumference of 109 inches including the capacitor. 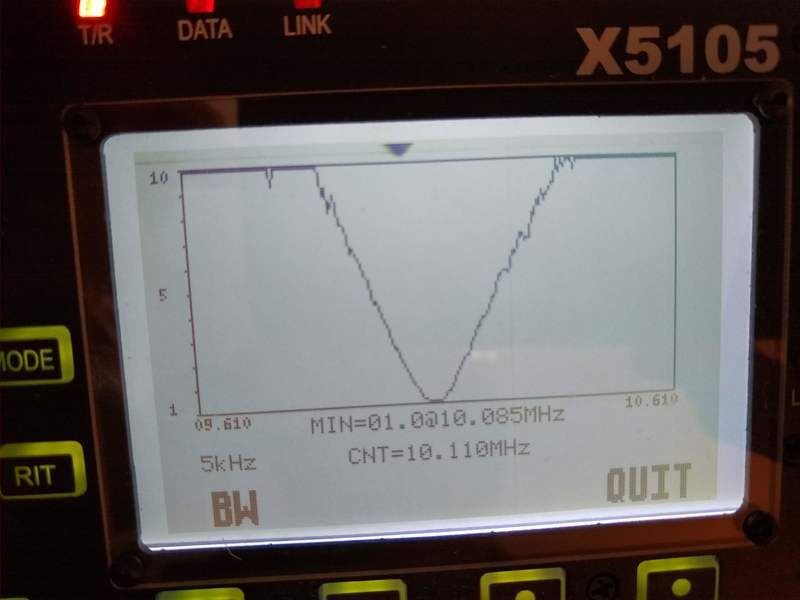 Oh, by the way, the antenna, as pictured above just after the QSO, was only about four feet off the floor of my ground floor ham shack/office! Thanks, Bert for the QSO. I have to say that I was surprised by the contact today. In spite of the testimony of others, I really have had rather low expectations for this thing. I tackled the project more to understand small loops than to actually use. I'm sure it is not "the best" antenna one can use but it has proven to me that it really is a useful one. To minimize hand capacitance I attached a short plastic shaft extension with a plastic knob. That appears to have completely solved that problem. and the rate of tuning is not too difficult to deal with. 2018-12-22a Another day spent on this crazy antenna. 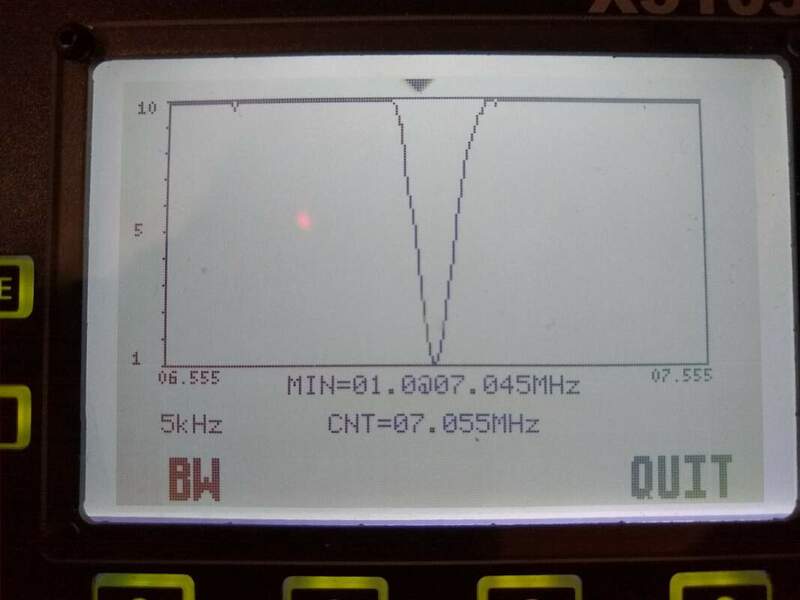 I decided to replace the capacitor with a two stage one that has nearly the same tuning range but there are no movable connections in the RF current path of the main loop. That's because one end of the main loop goes to one of the two sets of fixed plates and the other end of the main loop goes to the other set of fixed plates. The rotating plates which are connected to the shaft have the effect of connecting the two fixed plate sets in series electrically. But the signal never goes through any moving contact or wiper. The capacitor is from an old AM radio that I scrapped some years ago and has fairly wide plate separation. Further since the two variable capacitors are in series, the voltage is divided between them, albeit not evenly since the two sets of plates are of different capacitance values. The capacitor also has a large pulley which makes tuning it simpler. And there is less hand capacitance effect. I'm contemplating rigging up a dial cord arrangement which would make tuning even easier and totally eliminate hand capacitance. We'll see. Once everything was assembled I checked the SWR. With this capacitor it tunes 30, 40, 20, 17, 12 and 10 meters! As the graphs below show the SWR curves look quite good with a near 1:1 SWR on all bands. No on-air checks since by the time I finished building it, those bands had gone to bed! Maybe in the next couple days I can do some on-air tests, hopefully a QSO or two! 2018-12-22 Overnight I got to thinking about my transformer concept. It struck me that the number of turns of both the "primary" and "secondary" are the same, one turn. That seems more like an isolation transformer than a matching transformer. With a normal transformer if you have the same turns on both the primary and secondary you have very close to the same voltage and current in both! Double the number of turns on the secondary and you have approximately double the voltage on the secondary as primary, etc. But in this case, the only difference is the circumference (or diameter) of the two winding's, and the consequent difference in inductance. How does that "transform" the impedance? After doing quite a bit of reading no one else seems to address this so I'll quit worrying about it! 14" loop, ~75 ohms, 1.0 SWR. 17" loop, ~50 ohms, 1.0 SWR. 22" loop, <50 ohms, 1.1 SWR. 30" loop, ~11 ohms, 1.5 SWR. My test equipment consisted of an MFJ -204 impedance bridge and my X5105. I'm sure the actual impedance values are not precise but the trend seems clear, the Larger the loop beyond some point, the lower the impedance seen by the feed line. I then decided to do some more careful measuring with my RG8x driving loop. It seems to follow those same behaviors. Overall, I conclude that driving loop dimensions are not super critical. So go with the general guideline of about 1/5th the circumference of the main loop and use whatever material you have available. After reading the AA5TB article above I have decided to try a different capacitor. He makes the strong point that resistances in the main loop must be kept to an absolute minimum. One of the main sources of resistance are the contacts in a variable capacitor. 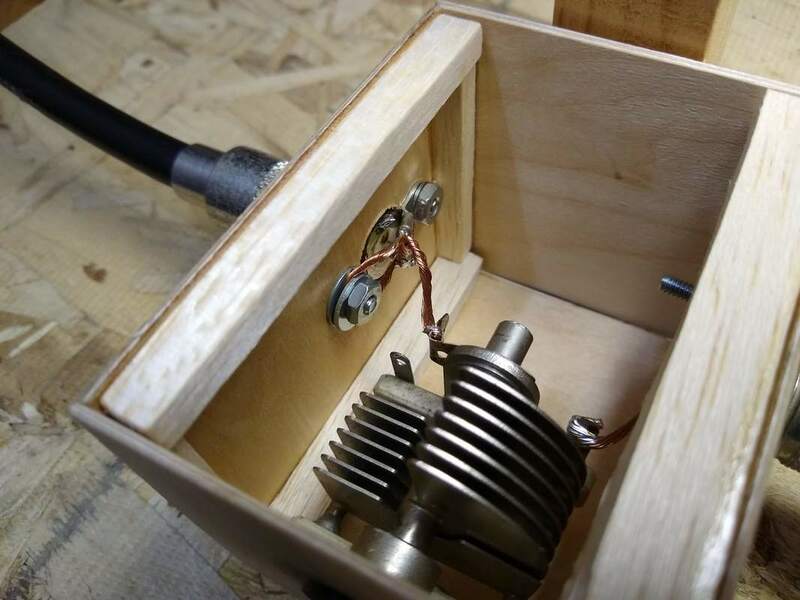 His suggestion is to use either a butterfly capacitor or just the stater sections of a multi stage capacitor such as used in older broadcast radios. 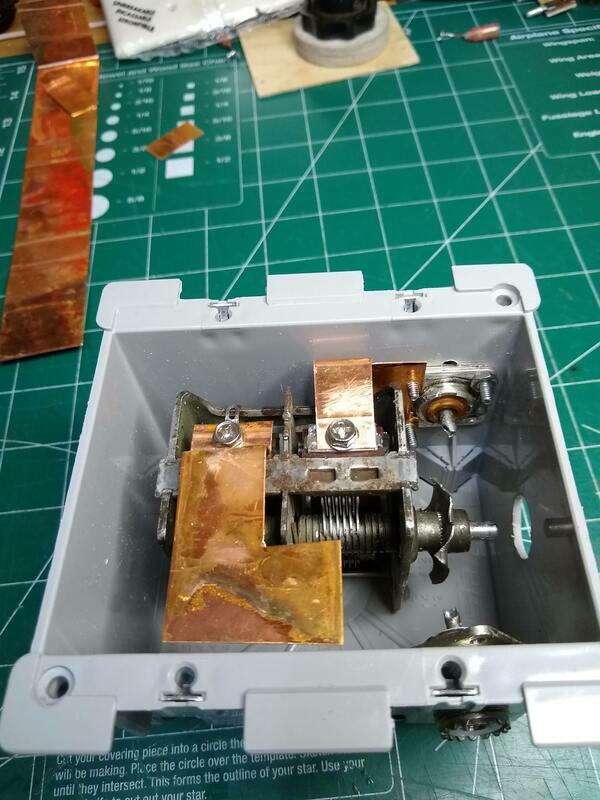 That removes any moveable physical connections from the circuit as the rotor in the latter case simply acts as a series bridge between the two stater's with only capacitance coupling. I know the rotor connection in the current capacitor is very fragile and minimal, unable to handle much current. I've got one that has an almost identical tuning range when used as he suggests, so back to the work bench! 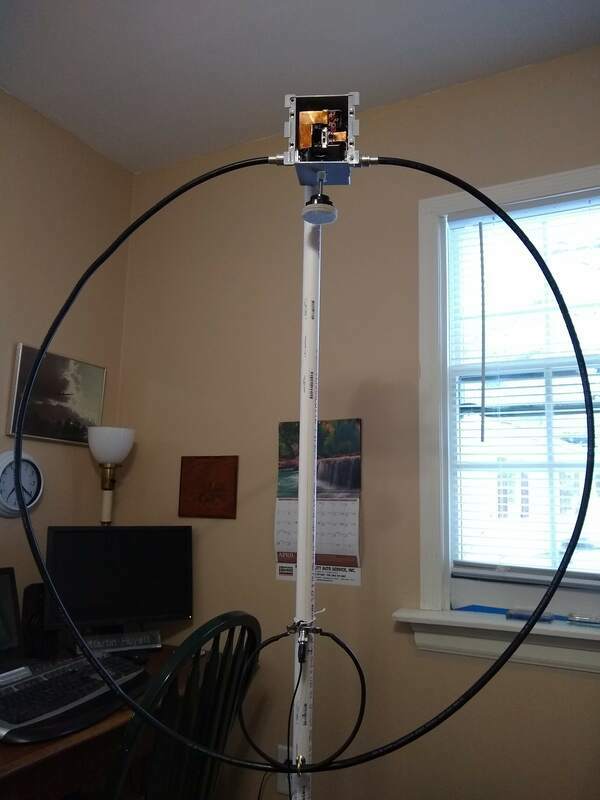 2018-12-21 There are many good YouTube videos on building Mag Loop antennas and I've gotten considerable help from some of them. The one I watched last night (I don't recall which one that was) had an idea the I knew immediately that I needed. One of the problems with the capacitor is the effect of hand capacitance. If you just move your hand near it, the resonance point will change. At least one person rigged up a motor driven capacitor with remote control. Clearly a solution but also a significant complication. The one that caught my attention was a guy who used a several inch plastic extension on the shaft so his had was kept well away from the capacitor when tuning. Today along with a few other changes to dress the thing up a bit I incorporated that. The picture at right shows how I did it. And it works very well! I didn't have time to actually work anyone today on 20 meters but I heard and tuned several stations. 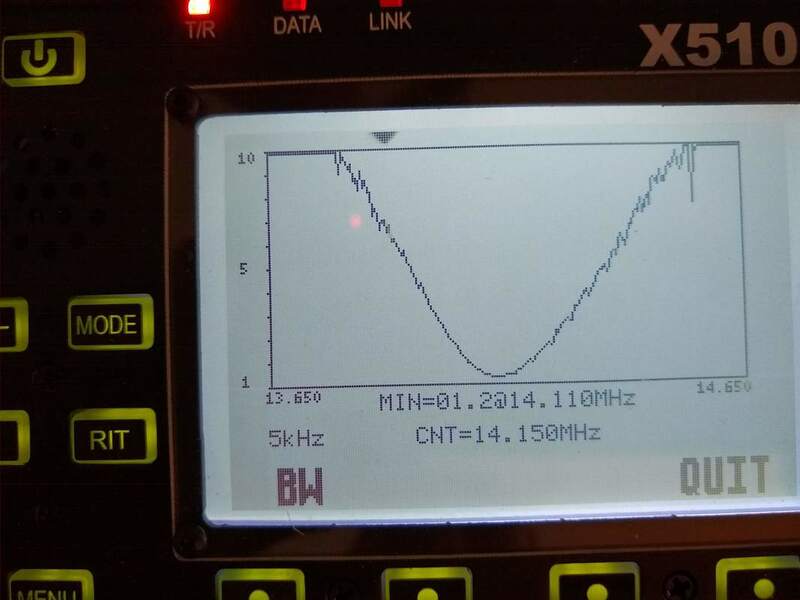 With that extension I was able to tune to lowest SWR quite easily after initially tuning for peak noise. 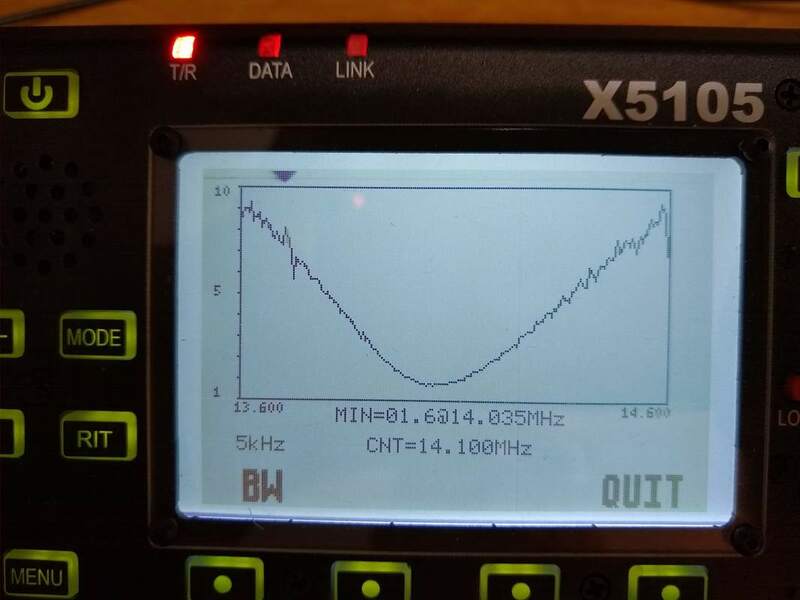 2018-12-20 Two or 1-1/2 QSOs is hardly solid data to analyze an antenna, but it is exciting, especially when it is with an antenna the likes of which you have never even played with previously in your career. And that is the case with this magnetic loop. To me they always seemed like a joke. But now I am convinced they are a serious antenna. The first qso with NM1I in MA, 800 miles east was on December 18 at 1650z on 14.033. He was initially a solid 559 but faded to unreadable but not before I had gotten everything. He gave me a 339 but I don't think he got my second transmission at all, hence the 1/2 QSO! The second was yesterday at 2037z on 14.057 with W5MIG in Texas, 1000 miles. He gave me a 449 and he was a solid 549 in here. Both were made using my x5105 at 5 watts. That one was interesting because I had just had a QSO with him at 2027z, also with the x5105 at 5 watts but using my G5RV station antenna. He was 579 in here and gave me a 539 using my G5RV. He didn't know I was going to call again as the thought just hit me when we finished. I have to say I was surprised that he heard me and responded. Thanks to both Butch and Jerry for "making my day!" Both times I had my loop sitting on a bar stool upstairs in our home where I could rotate it easily. I heard W5MIG with the antenna down stairs but very weekly. Those two contacts convinced me this is a viable antenna so I'll be making "improvements" to it and once the weather warms will be playing with it outdoors. 2018-12-19 I think I am closing in on a "final" version of my mag loop! Famous last words. 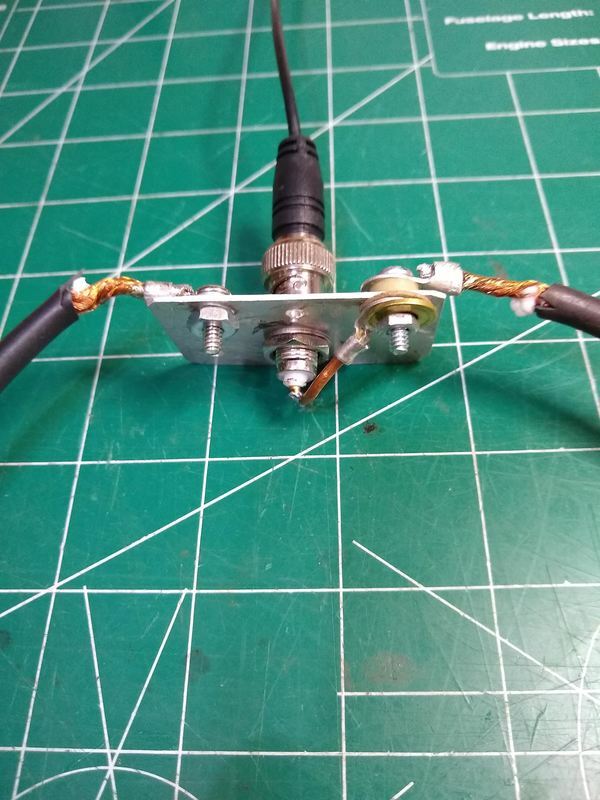 An antenna is never "done!" But this one is about as good as I can make it in its present form. And I'm fairly pleased. I have now had 1-1/2 QSOs with it, both on 20 meters. Both CW. both from our upstairs bedroom! Location wise, I know that is not a permanent location! But the ten or twelve feet higher with open space to rotate it makes a difference, I think. So here are the specs. Main Loop: 106" in circumference (about 3' diameter). 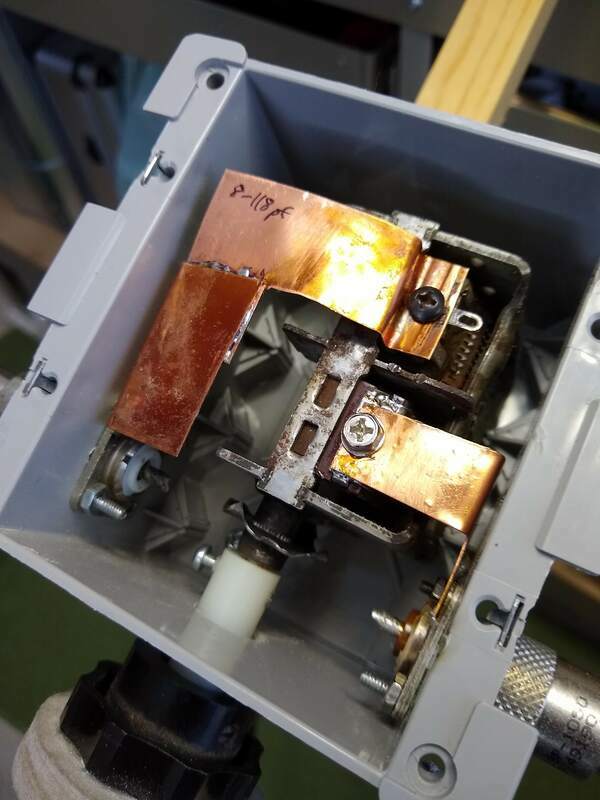 Low loss Low loss RG-8 sized coax with center conductor and shield tied together on both of the UHF jacks inside the capacitor box. Its inductance is about 3 uh. Small loop: 21" in circumference (about 8" diameter). RG-8x with the center conductor and shield soldered together at both ends so it will behave like a single of wire approximately 1/4 inch in diameter. Connects to a BNC jack (for the feedline), one end to the center the other end to the outer or ground side of the jack. The small loop measures about 0.6uh. Capacitor: Junk box variable with fairly wide plate spacing adjusts from 10pf to 101pf. Resonates the loop on 30, 20 and 17 meters. I may add a way to plug a fixed capacitor externally to allow resonating on 40 meters. 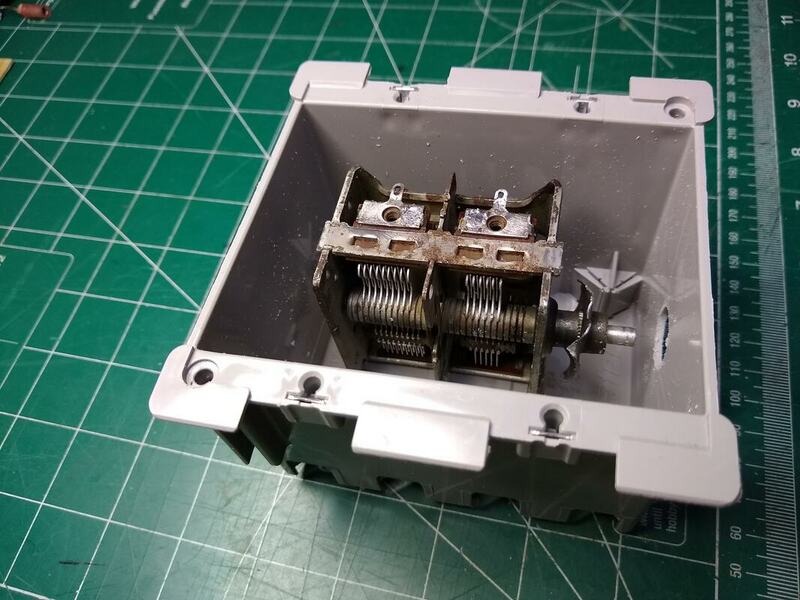 Capacitor Box: I built the capacitor box from 1/16th inch hobby plywood assembled using balsa corner blocks, cemented together with Insta-Cure CA from HobbyTown. Feedline: Four foot piece of RG-174 terminated both ends with a BNC connector. It is quite directional with strongest signal in the plane of the loop and fairly deep nulls broadside to the loop. 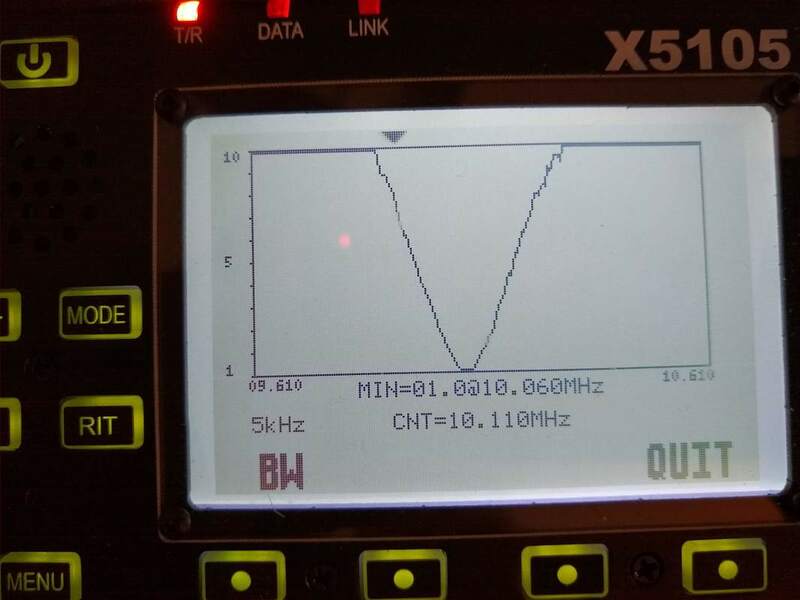 SWR is very low at resonance, no tuner is required. It can be tuned up on 40 meters as well as 15 meters but the calculator above indicates it will be low efficiency 40 meters. Bandwidth is very narrow as the Q is very high which makes tuning tricky. Furthermore hand capacitance is an issue. A larger knob might help with both. Most importantly, it does actually work! In good band conditions I can imagine it would work very well. And it was fun to build. Building it took magnetic loops from mystery to reality for me. 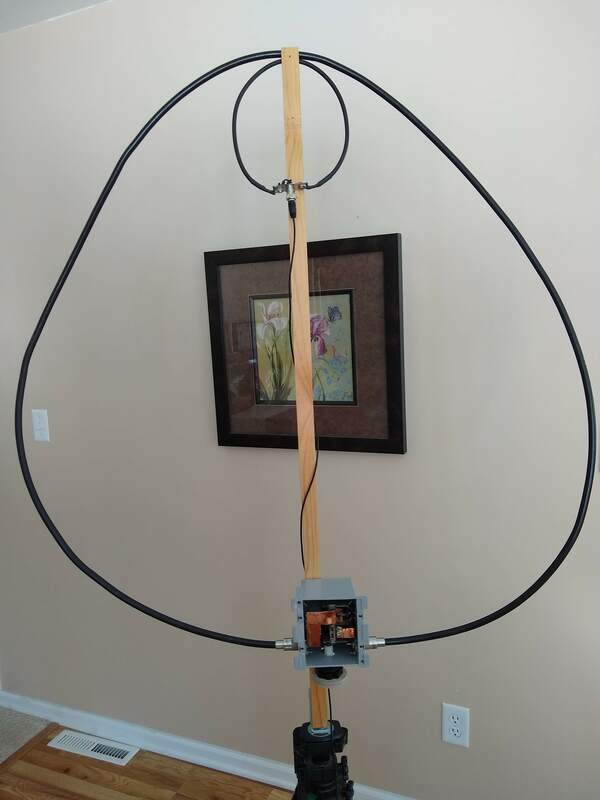 Like all antennas, it is very simple in both concept and physically. I'm guessing it is not by any means the world's best antenna, but it is clearly an option and one that will work indoors or where antenna supports are a problem. 2018-12-18a After the "success" mentioned below, I found a light weight, ten foot piece of 1/2 inch copper pipe in the garage. It had been under the house in the crawl space for some reason and the builder pulled it out. Suddenly, I have the main ingredient to make a more robust loop. Not sure it will be as portable as I was originally imagining, but it will certainly be overall "better", depending on my building skills! The calculator above says to make it into an octagon I need 8 sections, 1.25 feet each. My first thought was to buy 45 degree elbows but now I'm thinking I can make eight 45 degree bends and avoid needing the elbows and all the soldering involved. We'll see. That will be tomorrow's project. 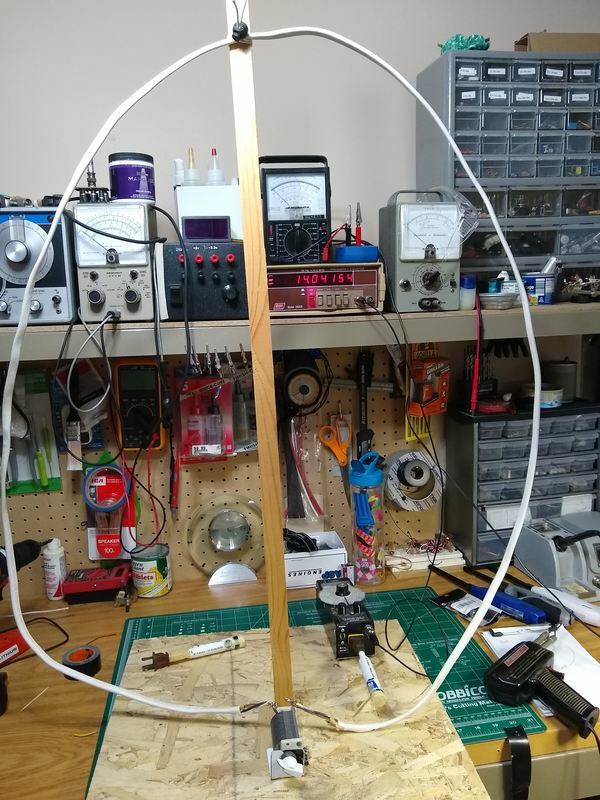 I've got a number of capacitor combinations I can use and I'll start with the small loop I already have although with a ten foot circumference for the main loop it should be 24" rather than 21". Will be interesting to see how big a difference that makes. 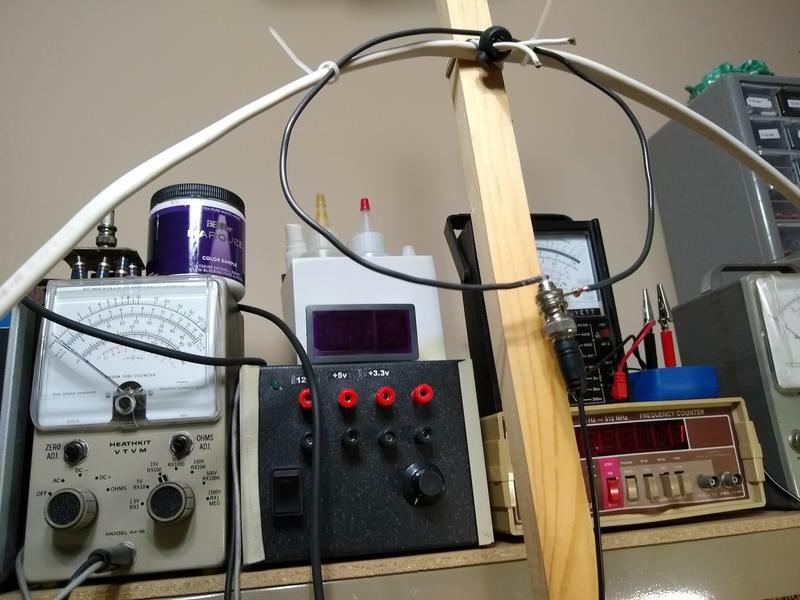 2018-12-18 I started today by making a new small loop using 21" of RG-8x, soldering the shield and center conductor together to form a single conductor that is 1/4 diameter. An alternative would have been to use 1/4 copper tubing or something similar. One end of this driving loop is soldered to the shield side of the BNC connector and the other end to the center conductor, forming a single turn loop about 8" in diameter. the feedline connects to the BNC connector. I just hung the loop on the fastener for the shock cord which was holding the top of my main loop up as shown below. The capacitor is a 14-310pf variable. 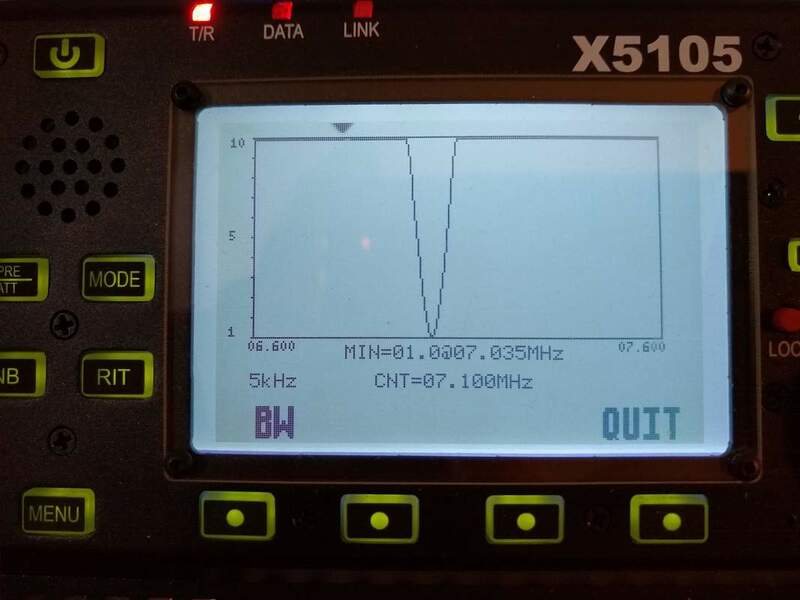 Once connected I used my x5105 SWR scan function to run a bandwidth scan on 40, 30, 20 and 17 meters which are shown below. It may just be me but it seemed that tuning was much more critical with these larger diameter wire loops than previously. Perhaps that reflects less resistance in the elements so less energy is going to heat and more to radiation? 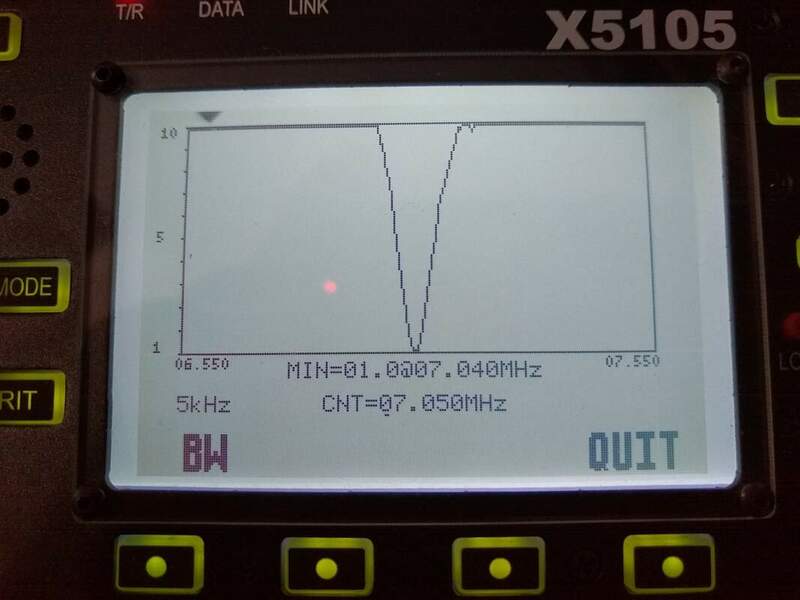 I noticed a difference immediately when I tuned 40 meters. I heard actual ham SSB transmissions. My "lab" is on the ground floor of the house so I decided to go upstairs to our main bedroom which has a large open space at the foot of the bed. My wife is out shopping right now so please, don't tell her! I again noticed a difference on 40 and tried but couldn't raise anyone. The Mag Loop Calculator above indicates that its efficiency on 40 is very low, about 5% or so I think. But I did notice that it is pretty directional. By rotating it on the bar stool I could see and hear quite a difference in signal strength. I also noticed a distinct noise on the band when "pointing" toward the neighbor's house which almost completely faded when I turned it broadside toward the house. So as indicated in some of the articles I've read it effectively blocks unwanted noise (if the signal you want is about 90 degrees from the noise source. Just to check to see if there was any activity on 20 meters I tuned up there and almost immediately heard NM1I calling CQ from MA on 14.033. So I tuned the capacitor for that frequency and went back to him. I was so nervous that it took me a while to discover my power was at 0.5 watts and then get everything tuned. But then I gave him a call and to my amazement he came back! Thanks Butch. He gave me a 559 and he was about 339 here but we lost contact as his signal began to fade during his initial transmission, dropping out completely. I never heard him again. But that was enough to light my fire! 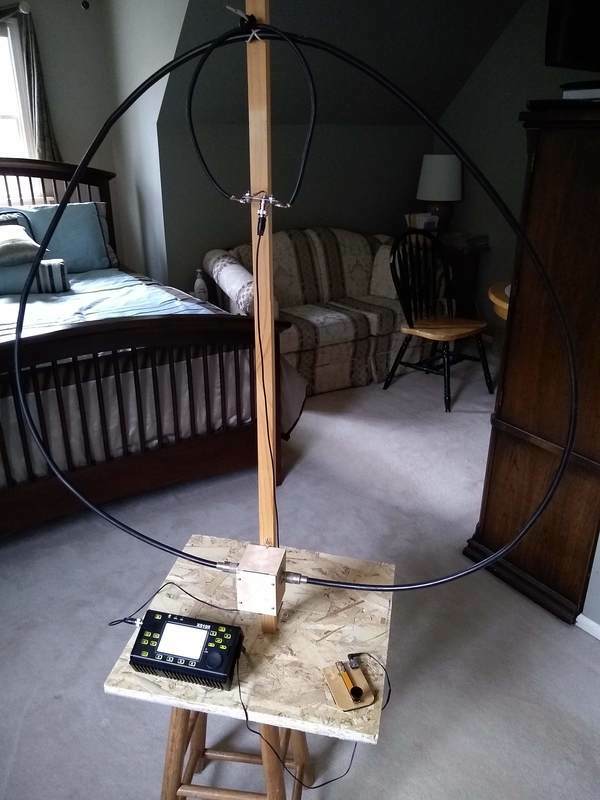 I'm sure this will not be my final rendition of a small magnetic loop antenna! They actually do work! 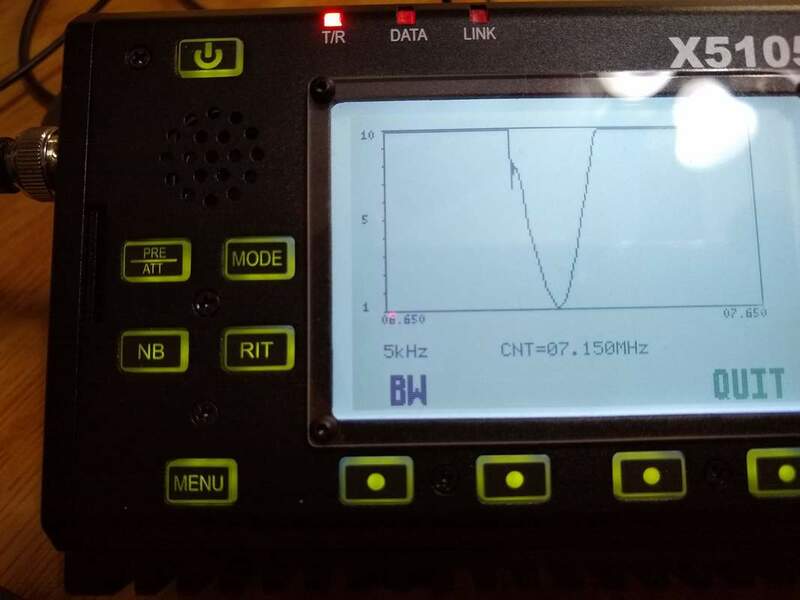 And I can't say enough about the xiegu x5105 transceiver, especially its SWR sweep function which makes building and tuning antennas a breeze, well almost! 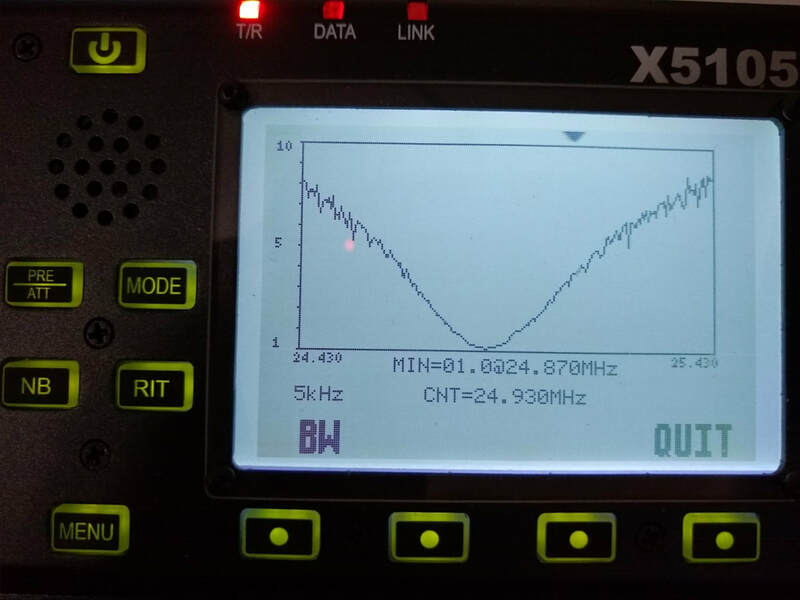 Seriously, it does work very well and it's nice to be able to punch the button, see exactly where your antenna is resonant, its SWR at resonance, tweak if necessary and then immediately transmit. No cables to change or anything. Pretty slick. Another observation is that the signal a few feet from the loop is about twice as strong to the right as it is to the left. and it is even lower broadside to the loop. I've read as much in other places but it is interesting to actually observe it. I used my DIY field strength meter to make the measurements. 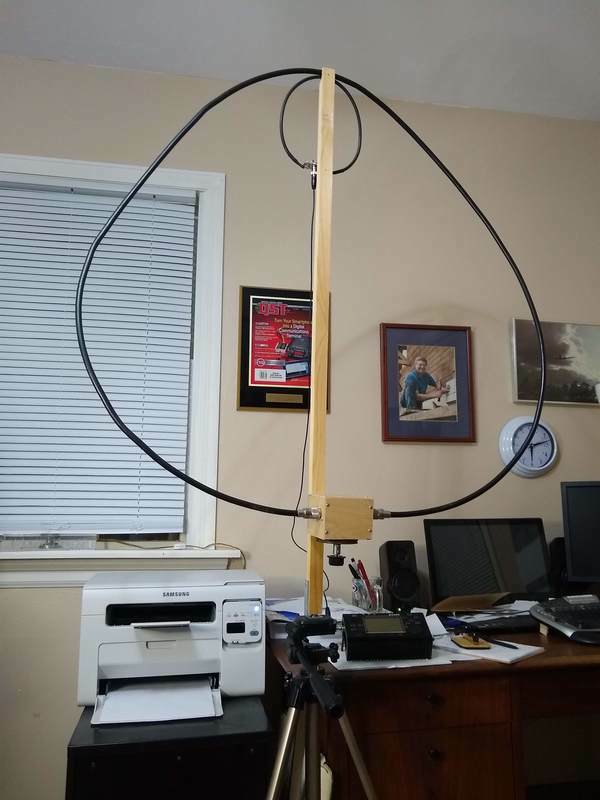 2018-12-17 I decided to redo the loop using some Low loss RG-8 coax I purchased years ago from Davis RF, their Bury-Flex Low Loss coax, to use with a 900 mhz FM rig. It is 0.4 in od. The piece I have is 8ft, 9in (106") long with PL259 connectors on each end. I rigged it up with the same capacitor I used below, 16-210pf. The small loop is 10 inches in circumference. I tied the center conductor and shield of the new loop together at both ends to form a single-like conductor. At near full capacitance it shows an SWR of 1.1:1 on 40 meters. on 30 meters it is 1.0:1. 1.6:1 on 20 meters and 2.2:1 on 17 meters. The article above states that the circumference of the small loop should be about 1/5th the circumference of the main loop which is about 21inches in my case. I tried making the small loop from 75ohm cable TV coax but to my surprise the shield is made of aluminum foil and wire which doesn't solder well! 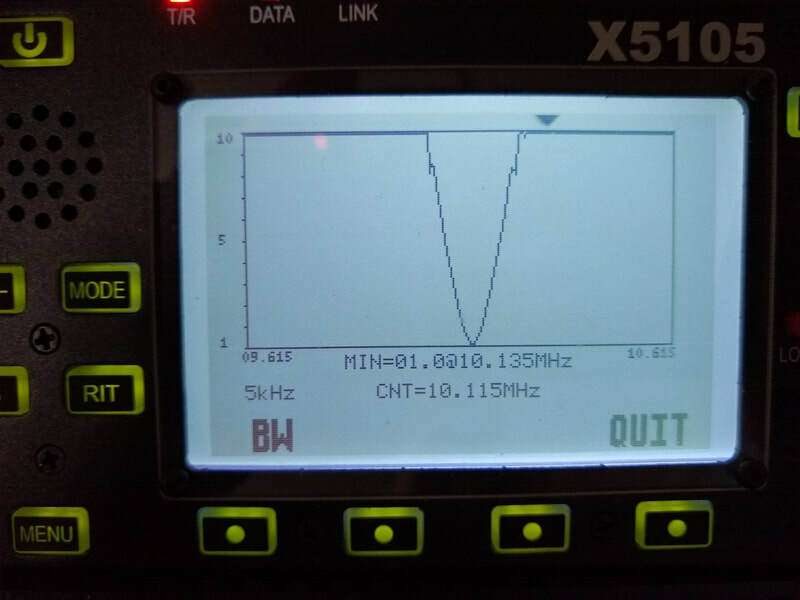 The question I am contemplating is why the SWR goes up with frequency? 2018-12-10 As I've thought about the magnetic loop antenna it strikes me that it is simply a tuned-secondary RF transformer with an un-tuned primary. The one turn (usually) secondary is high impedance and couples to the "ether" while the one turn primary is roughly 50 ohms and couples to the transmitter. That is similar to the tuned-secondary matching transformer circuit I used with my end fed half wave antenna with the primary difference being that a "radiating element" was attached to the secondary in the case of the end fed half wave whereas no such radiating element is used with the magnetic loop. I guess the secondary itself IS the radiating element. If that is even close to a valid way to think about it that also helps explain why the conductor size and RF resistance of the secondary is such a big deal as it is in essence in parallel with the impedance of the ether as seen by the secondary. And in a parallel circuit the lowest value is the dominant one and will be the biggest factor in absorbing energy. For whatever reason around 36 inches seems to be a practical trade-off diameter for the secondary turn in many of the examples I've looked at. So I dug around in my junk box and found an almost perfect length of low loss 3/8 inch coax. When formed into a circle its inductance measures 2uh. My junk box also yielded a 16-210pf variable capacitor with fairly wide spacing between the plates. So my plan is to start my project with those. I haven't decided on what I'll use for the primary yet but am thinking of a piece of old cable TV 75 ohm coax. the references I found indicate it should be 1/5th the circumference of the secondary which is about 20". 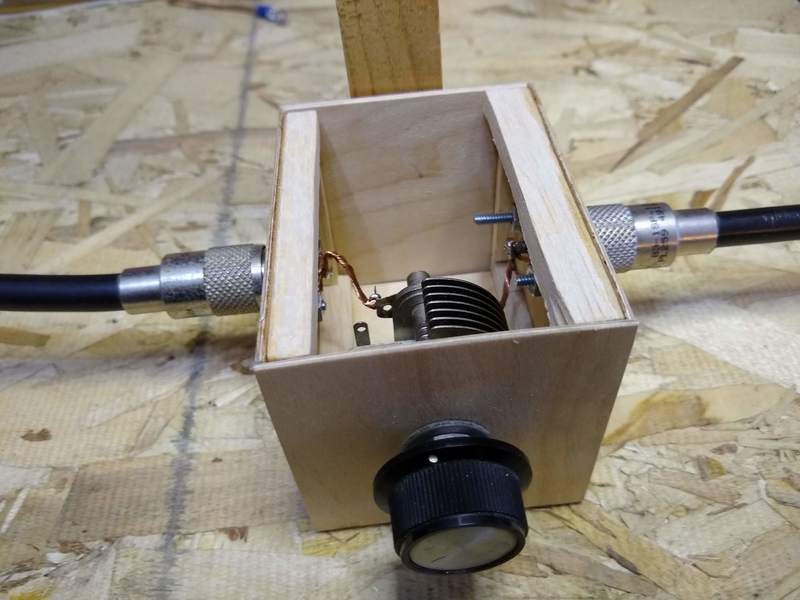 I'm planning this for use with a QRP transmitter, 5 watts. 2018-12-10a After getting most of my chores for the day done I decided to "build" the main loop. I say build with tongue in cheek as I really kind of hung it together. I wanted to see if it really would resonate near some useful frequency using the 16-210pf variable capacitor. Rather than using the piece of coax mentioned above I tied all three wires of a 102 inch piece of 12AWG with ground electrical wire together. 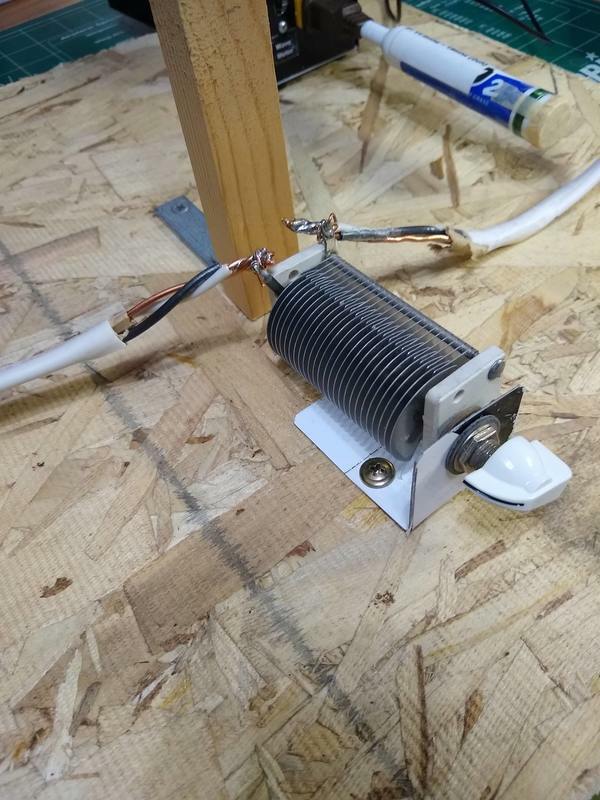 Then I "hung" the wire on a 40 inch piece of wood attached to a piece of OSB flooring and soldered the ends to the capacitor. Loop, counter dipper and capacitor setup on left. Center shows the connection to the capacitor. Right shows the home brew dipper. Finally, using my trusty home brew FET dip meter set to about 14.05 mhz as indicated on my antique frequency counter I tuned the capacitor to see if I could find a dip. I DID! In fact I could tune it all the way from 18mhz down to 6.7mhz. Not sure that is a practical range for use but it does resonate over that range. My experiment is successful! All I need to do now is add a small loop and see if I can get a useful match to a transmitter! 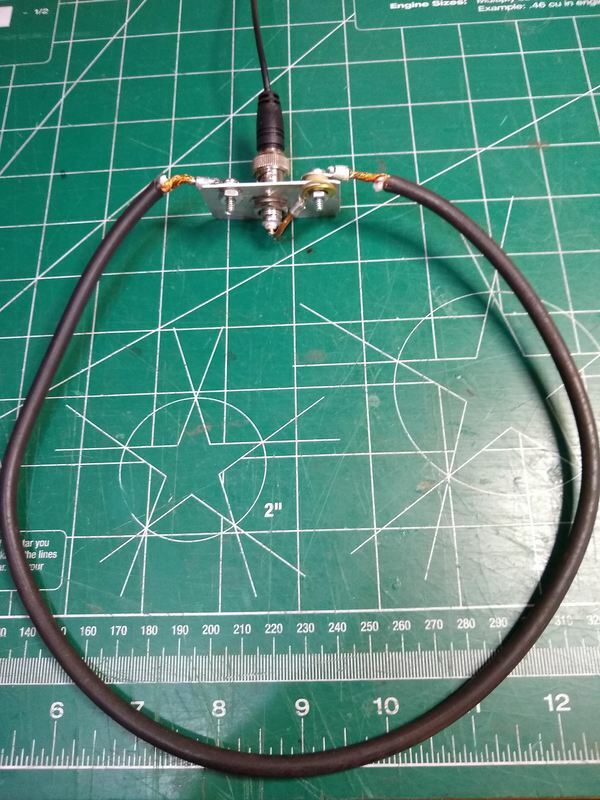 2018-12-10b Well, I quick threw together a loop made of 20 inches of #12 electrical wire and soldered the ends to a BNC connector. Then using tie wraps I attached it alongside the top of the large loop. A quick check indicated that the main loop resonant frequency wasn't affected much so I tuned it to 14.05mhz. Then using a three foot piece of RG-174 coax terminated with BNC connected the small loop to my Xiegu X5105 and ran a SWR scan with it. To my amazement and pleasure the SWR looked just like it should with the lowest point near 1:1 at roughly 14.05mhz! I ran SWR scans for 30 and 40 meters as well and the plots for all of them are below. The concept is proven! Would it, will it work on the air? I guess that comes next. Then I may build a "nice one" properly! Though I am very pleased with this concept model.